I’m a bit behind with my letters this week on account of having to go down to the unit area yesterday to see the RQ and as I didn’t get back till later my programme was thrown out of gear. However between parades I’ll catch up as soon as I can. 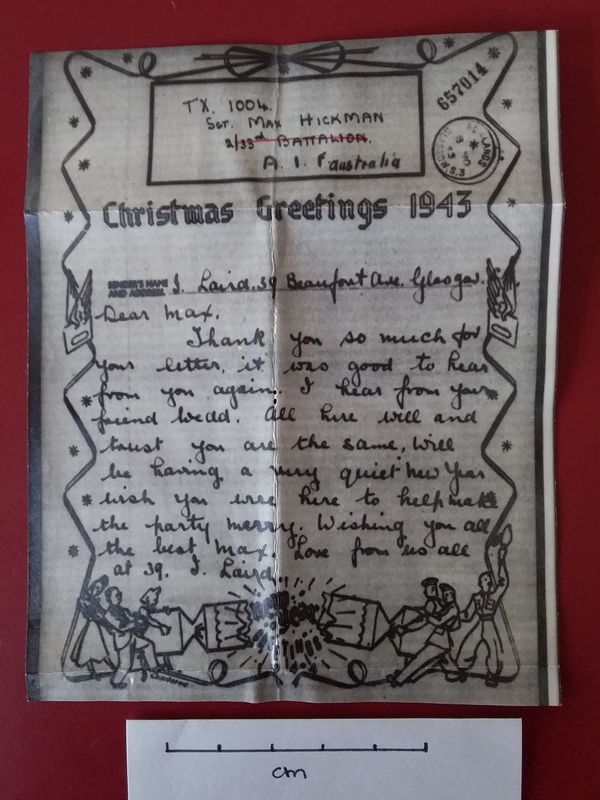 Your welcome letter and Christmas telegram arrived yesterday along with a bunch of letters, cards and air graphs – an extra bright lot – one of the best collections I’ve ever had in one bunch. I am glad you were able to get a drink for your birthday and its good to know you’ll have a drop for Christmas too. Have one for me, will you. It was a bad job Laurie’s car breaking down at this time of the year and with a job like that I suppose he’ll have a bit of a job getting it fixed. The turkey raising business sounds like a good proposition. The old gobbler must be a bit proud of himself, eh. I was glad to hear Anne’s show was a success and hope everything went well for her. I had no idea it was a big show she was in – she’s certainly stepping along, isn’t she? I wrote to Jim last week and will try and drop him a line in the Christmas weekend and send your message on to him as I know he’ll be pleased to hear from you. Old Pluto (Peter McCowan) and Bull Black are back with the bug and they told me Jim had got back to the mob just before they left – as fat as a seal. The high living he mentioned at the transit camp must have agreed with him. Peter and Bull had both got very thin but didn’t look too bad. They knew all the latest Griffin. Jonesy – our old Lieut – has caught up again and got the mob together. He was a great fellow Jonesy and could handle the mob better than anyone we’d had. 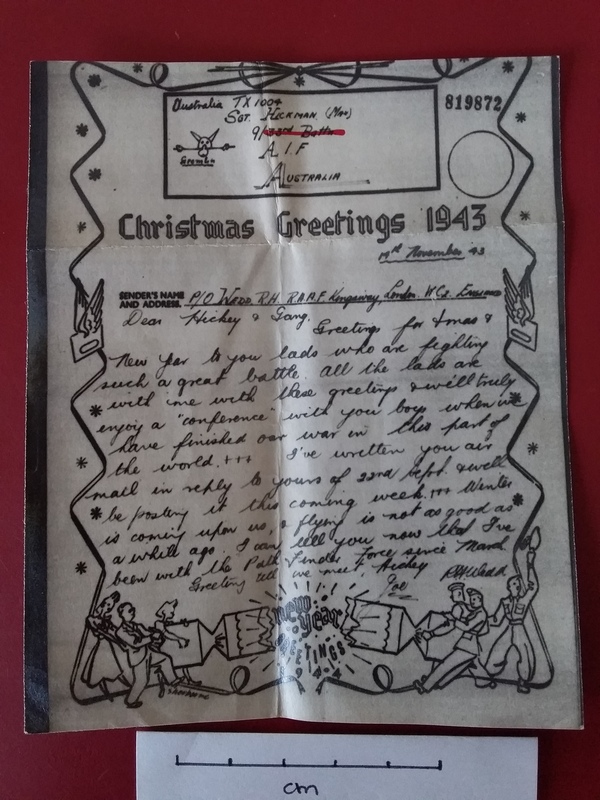 Among my letters yesterday were two air graphs – a special Christmas greeting variety – one from Wedd and one from Mrs Laird. I think I’ll enclose them in this letter. 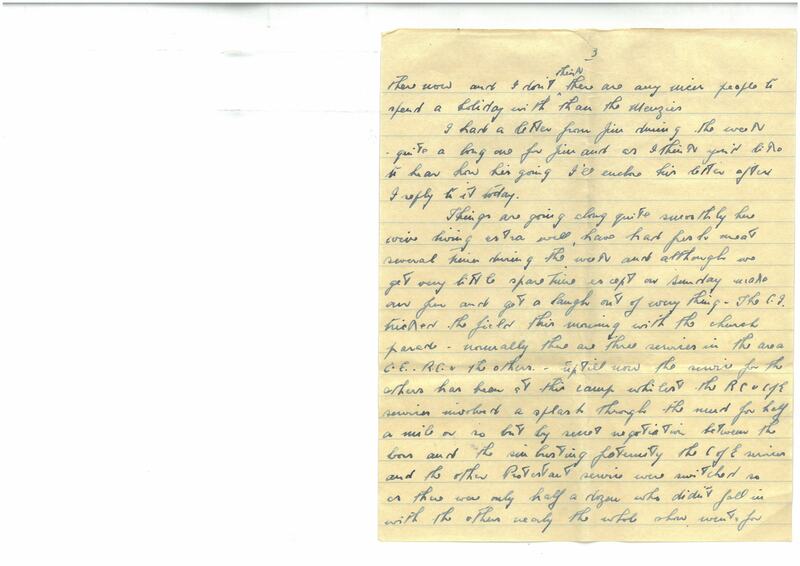 Youngster’s letters this week have been very cheery and she seems to be enjoying her stay in Sydney and is still very hopeful of Bill getting down early in the New Year. Scorn to entertain the thought. Bear our misery in mind. Portion out our mite of lamb. Of the gifts they say we gave. Strive to make it worth our while. Not a bad effort, is it? I guess the bloke who wrote it has been reading Pix and the Woman’s Weekly. Things are going along quite pleasantly here. We’re being kept very busy but get our share of fun out of it and as we’re living extra well – fresh meat three or four times a week – we haven’t much to complain about, all things considered. Must say cheerio now Mother and Dad. Give my love to May, Anne & Carline and best wishes to the troops for Christmas and the New Year. PS I see in the local rag that the unions are having a bit of a lick at Tom D’Alton. 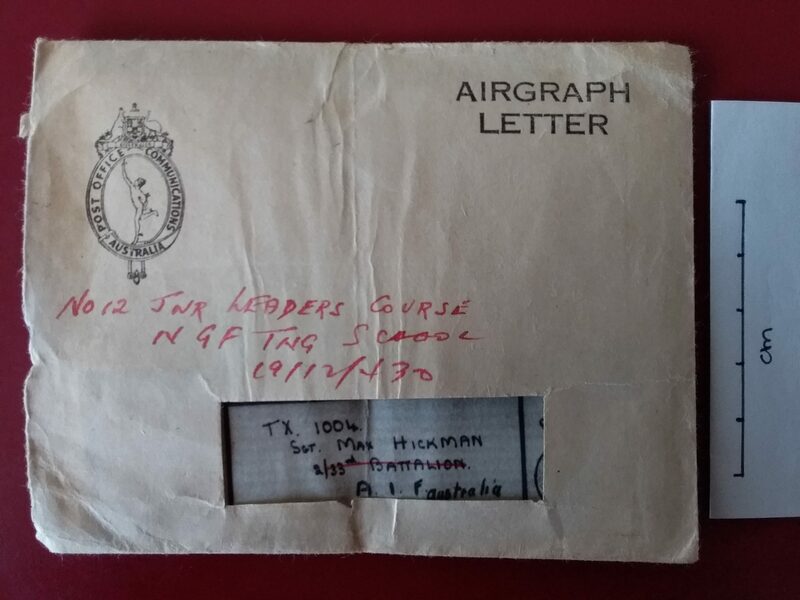 ‘Airgraphs’ were la means of distributing mail by air, via the intermediary of microfilm. 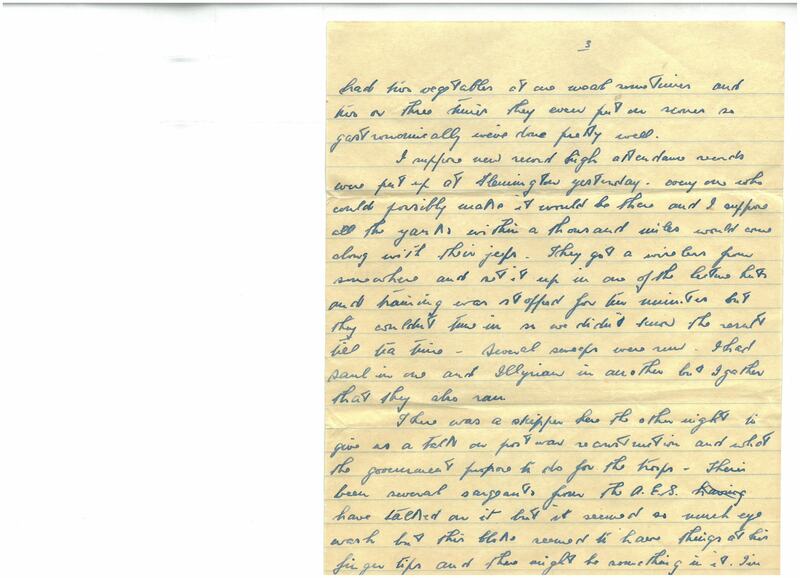 The history of the process and its introduction for UK servicemen is described here https://alphabetilately.org/airgraph.html …. 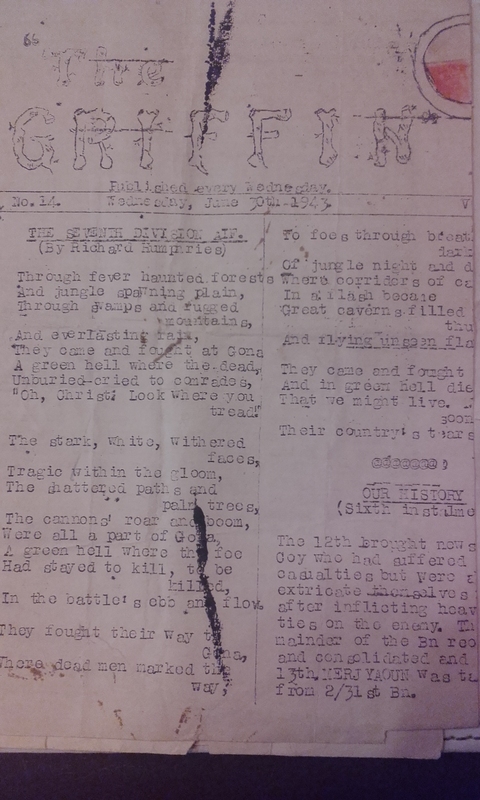 and an announcement detailing the start of the service in Australia in July 1943 is reported here https://trove.nla.gov.au/newspaper/article/75135665. 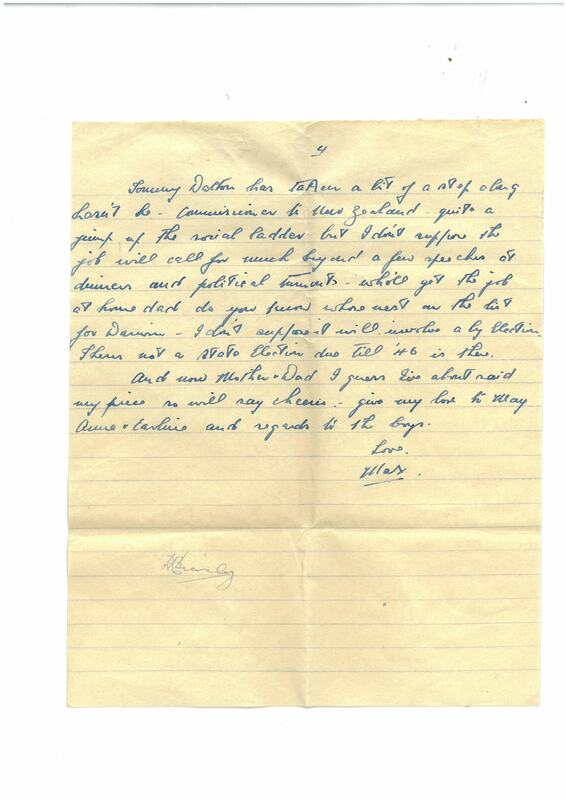 Essentially, letters were written on a specific form available from Post Offices. 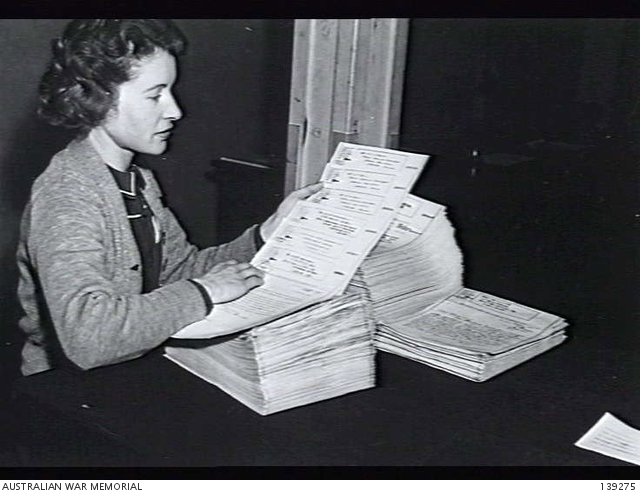 After arriving at the originating country’s central processing place (Melbourne, for Australia) the letters were sorted for destination, photographed and then dispatched in the form of microfilm (one roll holding 45,000 letters) and flown to the recipient country where they were printed on paper rolls and cut into individual pages, a quarter the size of the original. 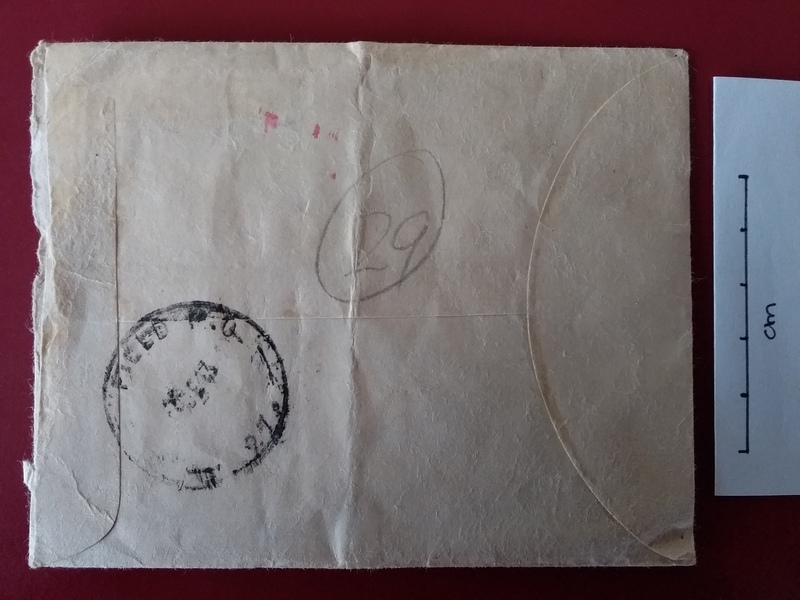 Each letter was then folded and sealed into a special envelope, with the addressee’s name and address visible through the space provided. 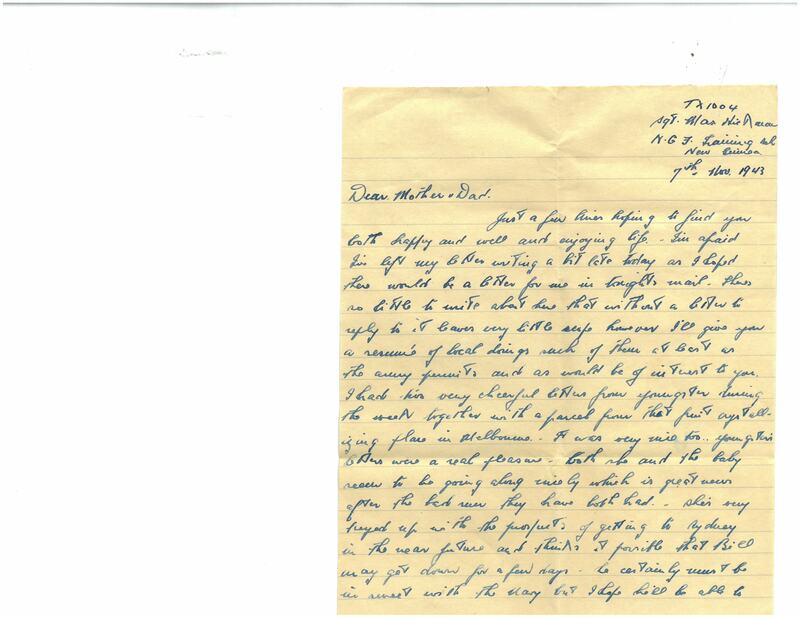 Images at left : Envelope containing the letter from the Laird family addressed to Dad – with the address changed (presumably at Field HQ) to indicate his whereabouts. This is the only written confirmation of the specific ‘school’ he was attending. Sender: J Laird. 39 Beaufort Ave. Glasgow. Thank you so much for your letter. It was good to hear from you again. I hear from your friend Wedd. All here well and trust you are the same. Will be having a very quiet Hew Year. Wish you were here to help make the party merry. Wishing you all the best Max. Love from us all at 39. J. Laird. 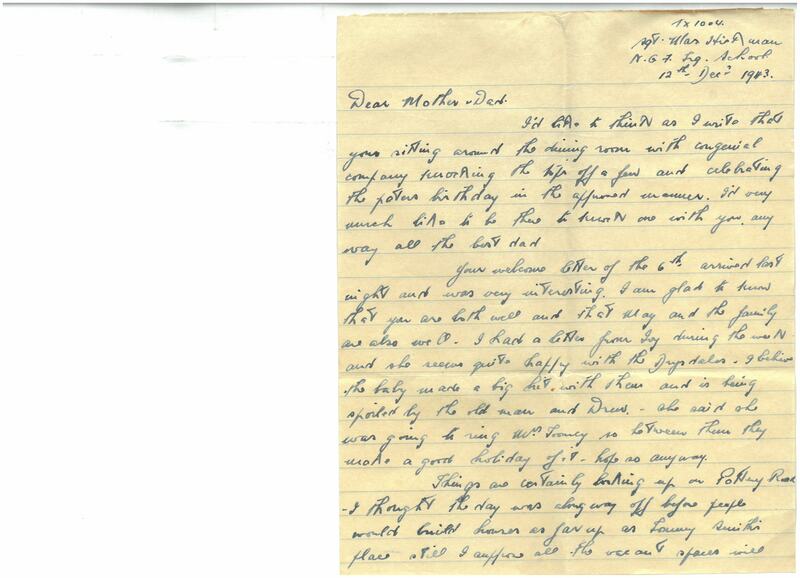 The Lairds were the family with whom Dad and his friend Graeme Watts had spent New Year’s Eve/ New Year’s Day 1940/41. 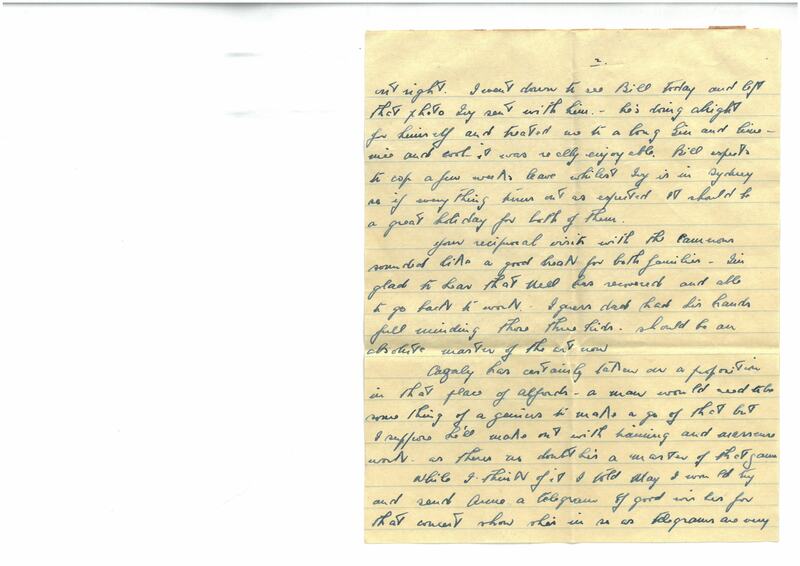 (See post dated 11 January 1941) This is one of several letters from Mrs Laird and their daughter Billie that Dad kept with his wartime correspondence. Greetings for Xmas & New Year to you lads who are fighting such a great battle. All the lads are with me with these greetings & we’ll truly enjoy a ‘conference’ with you boys when we have finished our war in this part of the world.+++ I’ve written you air mail in reply to yours of 22nd Sept & will be posting it this coming week. +++ Winter is coming upon us, & flying is not as good as a while ago. I can tell you now that I’ve been with the Path Finder Force since March. Greetings till be meet, Hickey. RH Wedd. 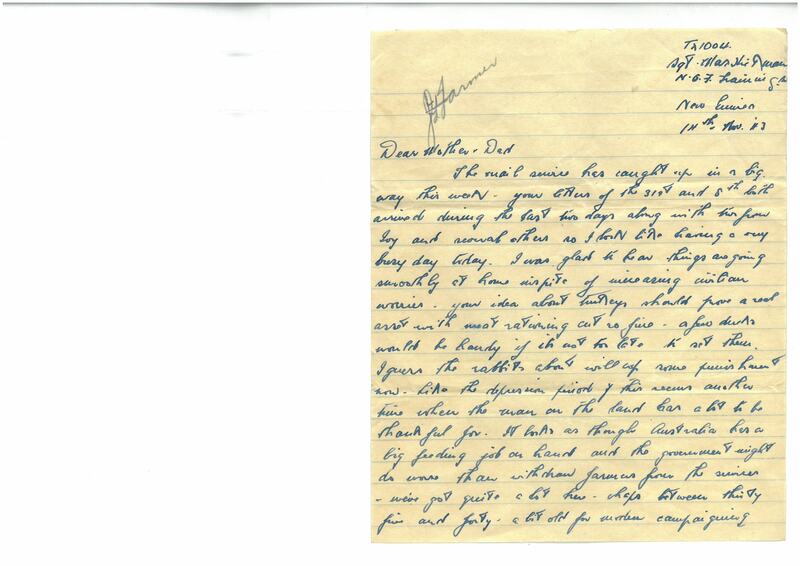 By a sad coincidence, on the day Dad was writing this letter, Rex Wedd’s plane was shot down over Germany. After a lapse of about a week the mail has come good again to everyone’s relief. It’s surprising how it affects the chaps not getting their mail. 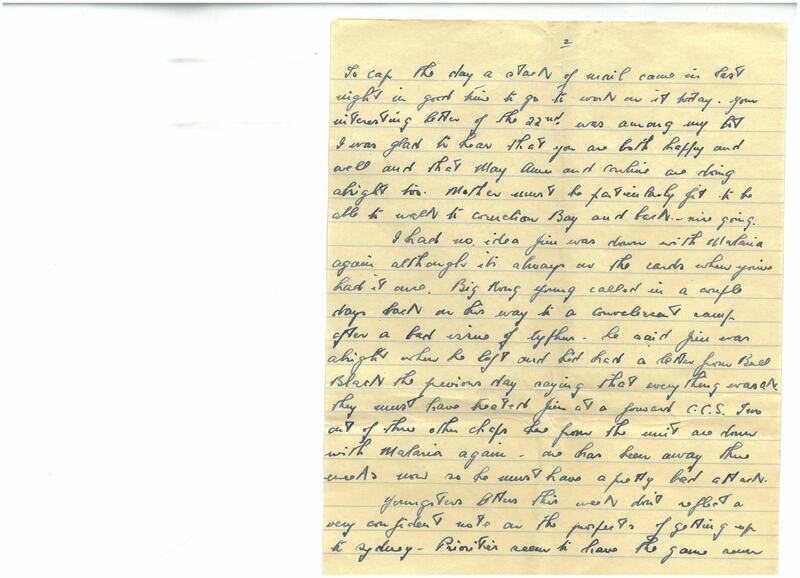 Your letter of the fifteenth, two from Ivy and one from May Roberts – you may remember her, she was one of Max Phillips’ girl friends – so I did pretty well out of the issue. Am glad to hear that things have taken a brighter turn, both at home and at Ivy’s. I read a bit in today’s local rag about Dalton retaining his seat whilst holding the office of Commissioner to NZ. That’s about the toughest thing I’ve heard of, a man dragging the screw he will to come at that. 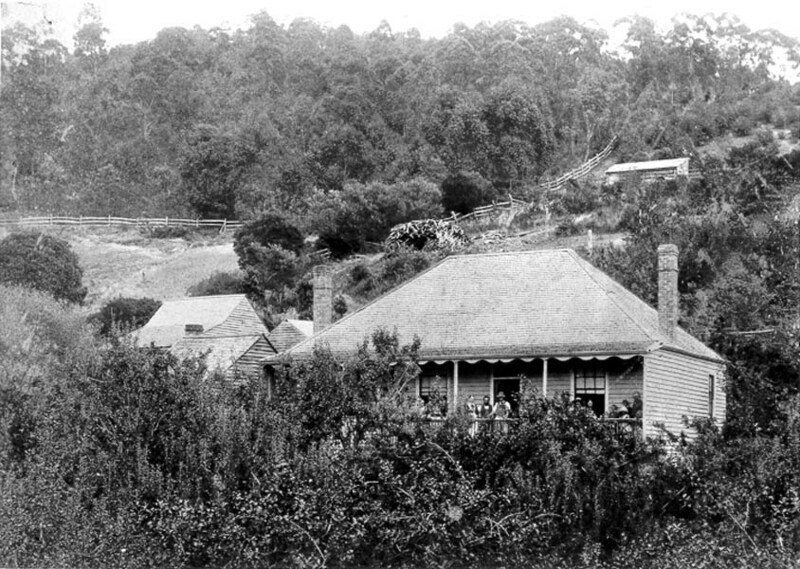 If it hadn’t been for Albert Ogilvie he’d still be working for Mount Lyell. It’s a case of make hay while the sun shines, isn’t it. 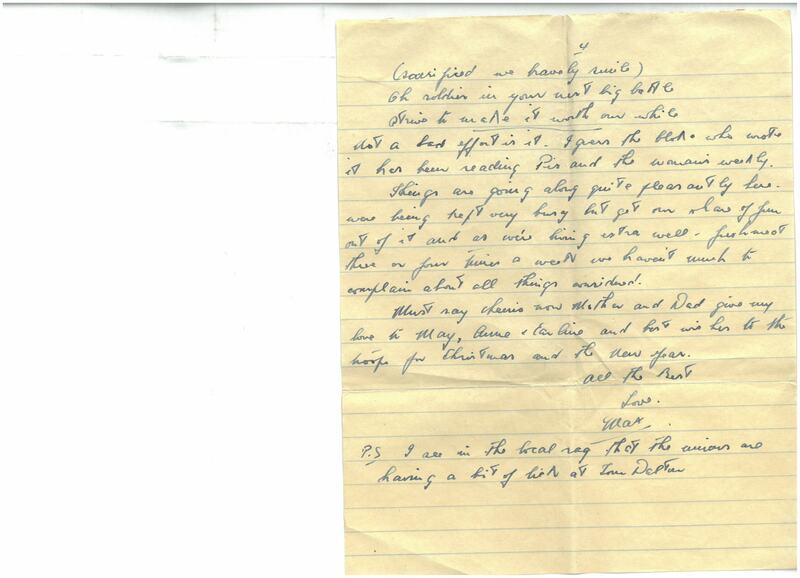 Youngster’s letters were both very bright and cheerful. She seems very wrapped up with the proposed trip to Sydney and I hope everything turns out right. I went down to see Bill today and left that photo Ivy sent with him. He’s doing alright for himself and treated me to a long Gin and lime – nice and cool, it was really enjoyable. Bill expects to cop a few weeks leave whilst Ivy is in Sydney so if everything turns out as expected it should be a great holiday for both of them. Your reciprocal visits with the Camerons sounded like a good break for both families. I’m glad to hear that Nell has recovered and is able to go back to work. I guess dad had his hands full minding those three kids. Should be an absolute master of the act now. Cazaly has certainly taken on a proposition in that place of Alfords – a man would need to be something of a genius to make a go of that but I suppose he’ll make out with training and masseur work as there’s no doubt he’s a master of that game. While I think of it, I told May I would try and send Anne a telegram of good wishes for that concert show she’s in so as telegrams are very unreliable as far as time goes I’ll send it next weekend if I can, and May can hold it and give it to Anne the day of the show. Unless Tiny gets another attack of Malaria or something I can’t see him getting home for Christmas as latest indications are that his mob won’t get back till well into next year and things would have to move very smartly for him to make the grade in five weeks. I’m expecting to get a letter from Viv or Jim next week and will probably get the Griffin from them. I struck another of the old mob that were in Brighton when I was there today – he’s up here with a working party – a chap named Cole from Cygnet. Sorry about that fountain pen dad. I knew things were tough but thought there might be just a chance. I hope I’ll be able to look after Laurie’s pen but with our mode of living things get broken very easily. Thank Laurie for the loan of it for me will you. Must say cheerio now. Give my love to May, Anne & Carline and best wishes to the boys. PS We filled in forms for a new army book the other day – on the same lines as Soldiering On. It’s called Khaki & Green. 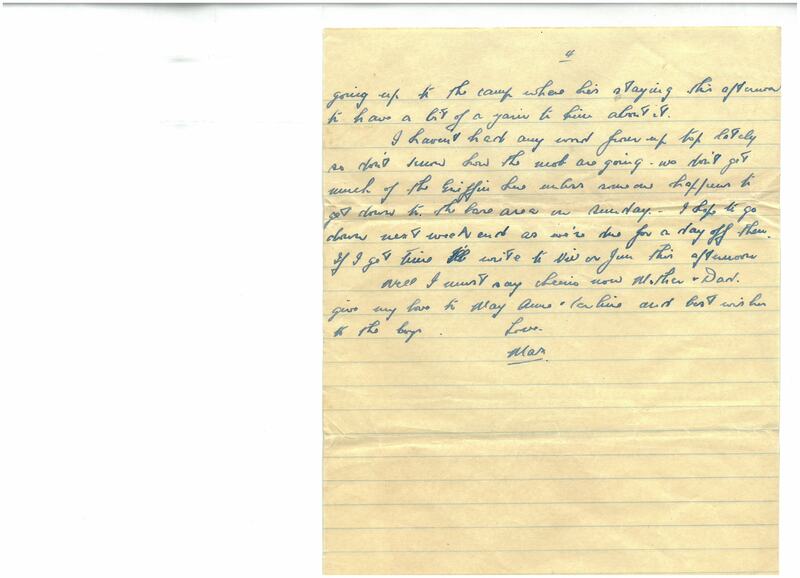 I hope it arrives OK.
Bill Drysdale was Dad’s brother in law, married to his sister Ivy. 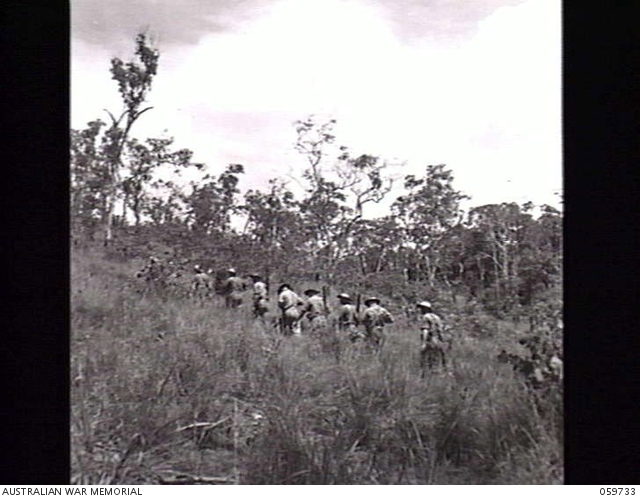 At this point, he was a lieutenant in the Cyphers section of the Navy Office – based at Port Moresby. 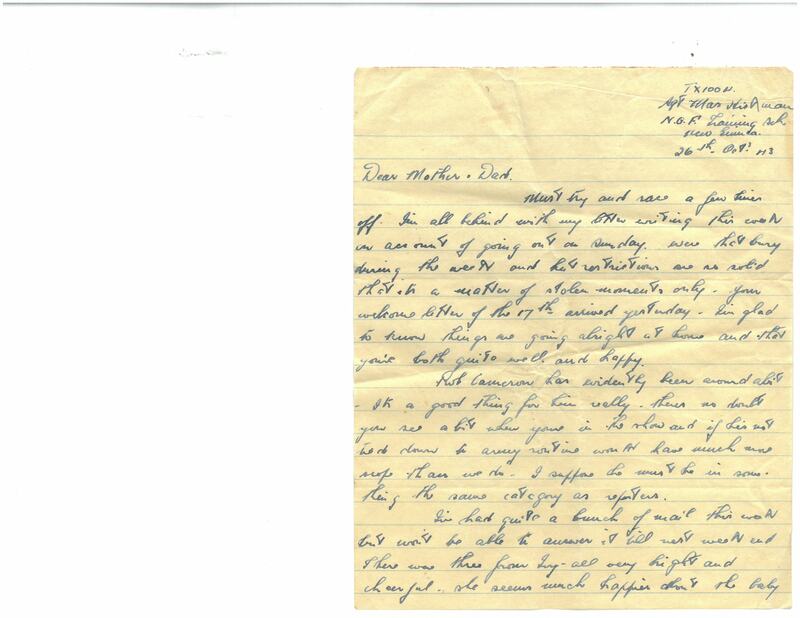 In a letter sent by Ivy to their parents, dated 27 November 1943 she says: I don’t know just exactly how far Max is from Moresby. According to Bill it’s a hell of a long way – further than their transports are allowed to go. However, the situation was not unique : Britain’s High Commissioner to Australia at this time was Sir Ronald Cross who continued to hold his seat in the House of Commons. It’s a real rest day today – spine bashing is first favourite with every body. The CI gave us yesterday for a sports programme and everything went off perfectly. The weather was perfect – the first day since the school started that it hasn’t rained. The morning was given over to team sports – basketball, softball and cricket. I had a go at the basketball. She was just about all in and when it was finished you could have wrung us out but it was a good game. The softball and cricket both finished very close too. The afternoon was taken up with an athletic carnival and competition throughout was keen- there’s some good timber amongst the mob. Prizes supplied from Regimental funds were of a type approved in these parts, ranging from a half a pound of tobacco to chocolates and PK’s. It was one of the most enjoyable days I’ve had for a long time in the army, but we’re all powerful stiff today. To cap the day a stack of mail came in last night in good time to go to work on it today. 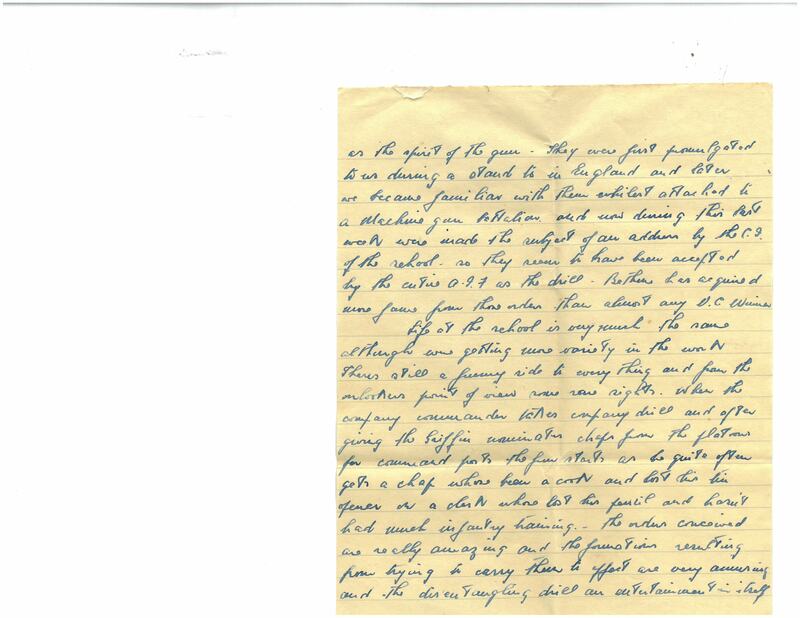 Your interesting letter of the 22nd was among my lot. 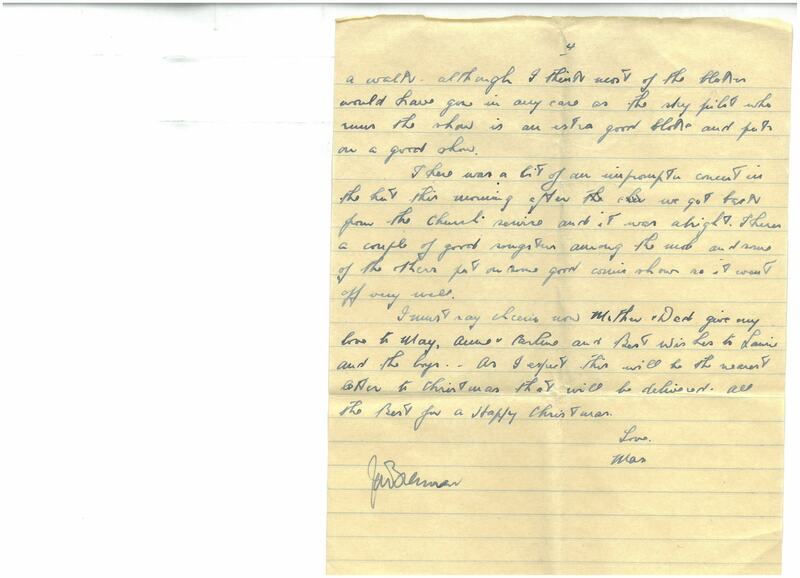 I was glad to hear that you are both happy and well and that May, Anne and Carline are doing alright too. Mother must be particularly fit to be able to walk to Cornelian Bay and back – nice going. I had no idea Jim was down with Malaria again, although it’s always on the cards when you’ve had it once. Big Kong Young called in a couple of days back on his way to a convalescent camp after a bad issue of typhus. 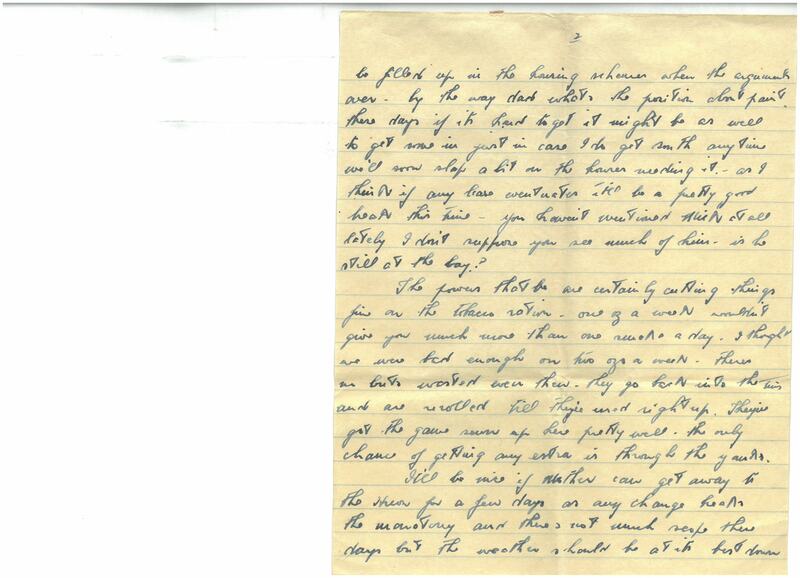 He said Jim was alright when he left and he’d had a letter from Bull Black the previous day saying that everything was OK. They must have treated Jim at a forward CCS. Two out of three other chaps here from the unit are down with Malaria again. One had been away three weeks now so he must have a pretty bad attack. Youngster’s letters this week don’t reflect a very confident note on the prospects of getting up to Sydney. Priorities seem to have the game sewn up – Members of Parliament and civil servants and their families and friends. There’s no doubt about it: those in a position to crack the whip abuse their privileges. John Citizen certainly has a load to carry. My compliments to Claire Graydon on her commission – she must be soldiering on in a big way. If the powers that be are turning out commissions in the womens services at the same rate as the army, the social calendars will [embrace??] numerous more volumes after the argument than they did before the war. Still those pips on the shoulder mean a bit in the way of authority and privilege and are a passport to comforts that in civvy times were reserved for society and the power of the purse. Young Reg must be pretty sweet with the heads – he’s not been out of Australia at all yet, has he – must have struck a job like Max Phillips’ cobber Royce – Pilot Officer Instructor in Sydney.’Well I must say cheerio now Mother & Dad. Give my love to May, Anne & Carline and best wishes to the boys. 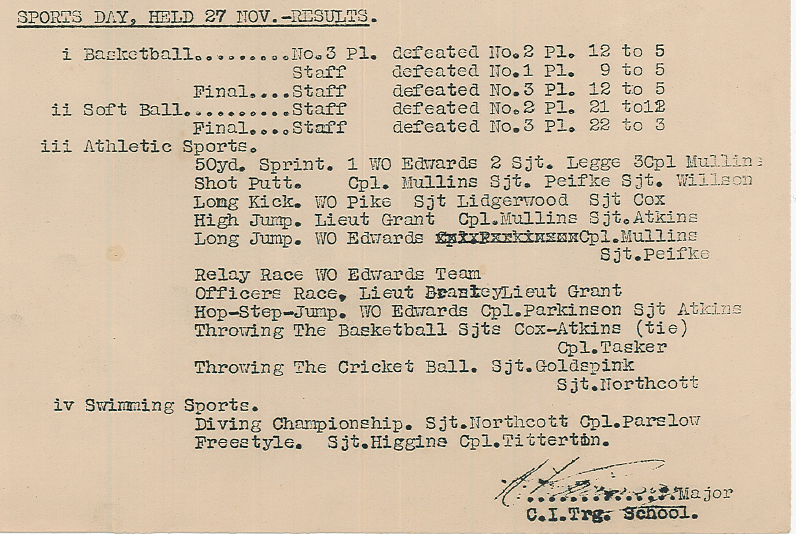 The published results (shared in this image) included all the sports mentioned in this letter – and also swimming and diving! This seemed incredible, until I found the photo of a diving board over the river, and a note in later Routine Orders, detailing a group to carry out maintenance on the swimming pool. 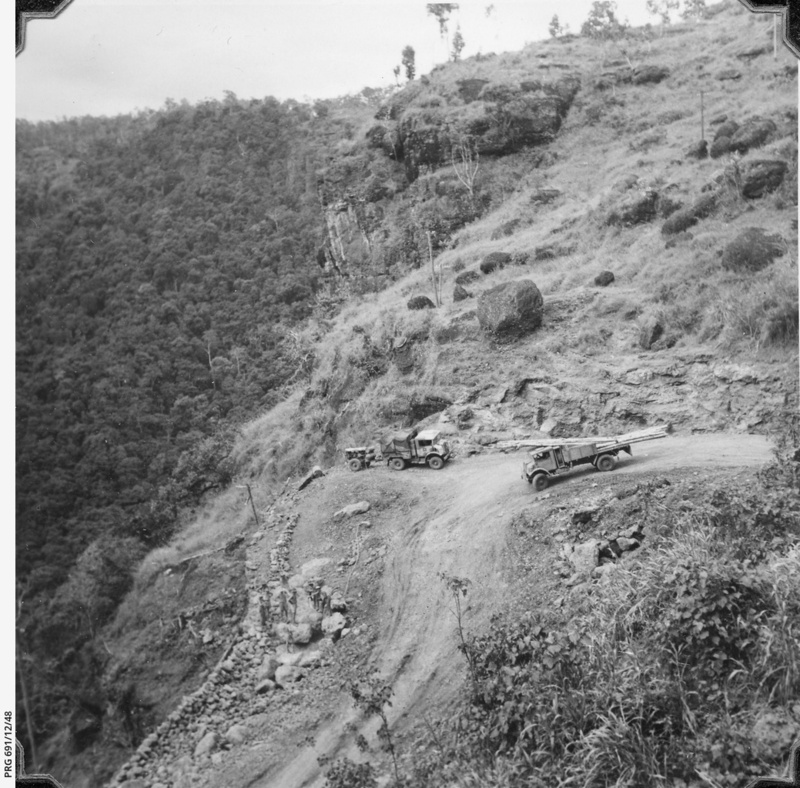 Sogeri Valley, New Guinea 26/6/43 Midday mess parade of the New Guinea Force School of Signals crossing bridge. 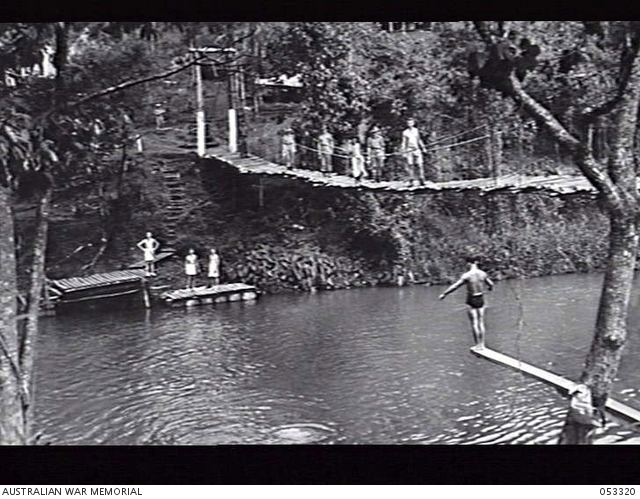 Below the bridge can be seen diving boards and pontoons constructed by the troops. As well as these research efforts, unit commanders were required to enforce personal protection measures including the taking of suppressive drugs (chiefly quinine at this point), use of nets and restrictions on hours for bathing. 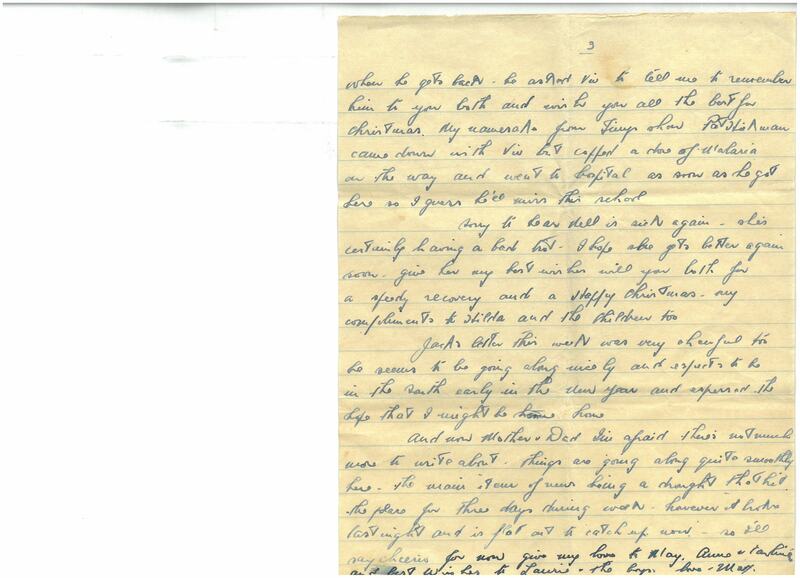 At the time of this letter, soldiers were still permitted to wear shorts when not on parade, between the hours of 0630 and 1800. However, soon afterwards it became an offence to wear shorts, and shirts had to be worn with long sleeves fastened at the wrist. 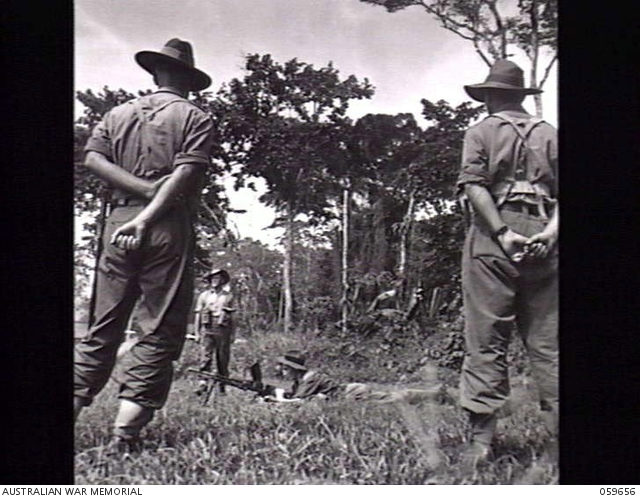 ( Routine Orders December 16: AWM 52/34/13/4 p 53) – 3 pairs of slacks were issued to each soldier. CO’s were however permitted to allow men engaged in hard physical work to roll up their sleeves or even work bare-chested, between the hours of sunrise and sunset. 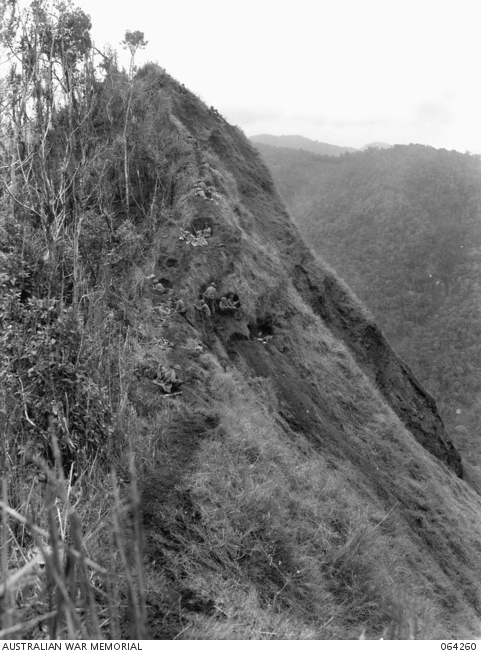 A clear indication of the terrain referred to in the extract above. The first Officer’s Training School was held in Victoria in November-December 1941. During this time Japan entered the war and the need for womanpower in the Army was accentuated, recruiting and training commenced as soon as AWAS Officers returned to their areas. The types of recruits were quite splendid, alert, responsible and invariably inspired to volunteer by strong personal motives. Initially the Army only envisaged that women would be employed as clerks, typists, cooks and motor transport drivers, and in small numbers, however, the demand grew very quickly and by the end of 1942 12,000 recruits had been enlisted and trained. While at first AWAS were posted only to Headquarters, and Base Installations, they later took up duty, after specialist training in almost all Army Services. 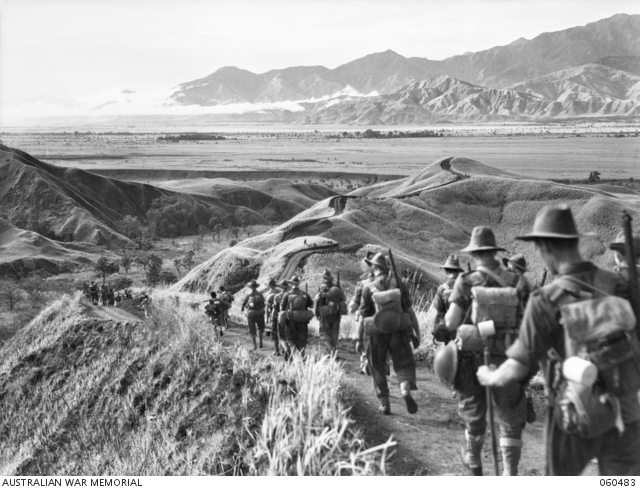 It is of interest to note that 3,618 served with the Royal Australian Artillery and they manned the Fixed Defences of Australia from Hobart in the South and Cairns in the North, and Perth in the West. 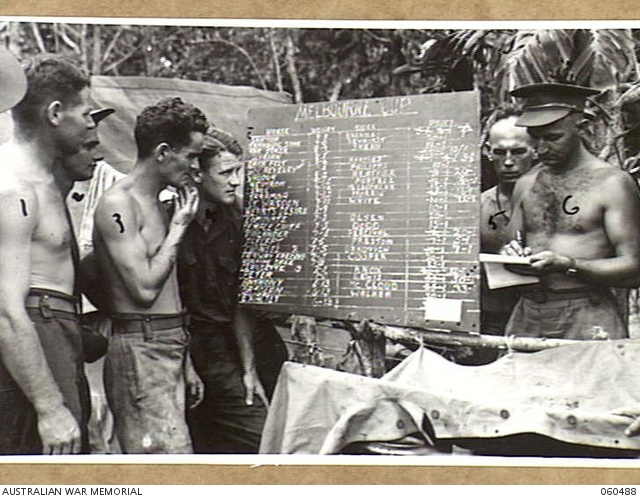 And again 3,600 served in the Australian Corps of Signals, where they proved themselves well adapted for the type of work required of them. 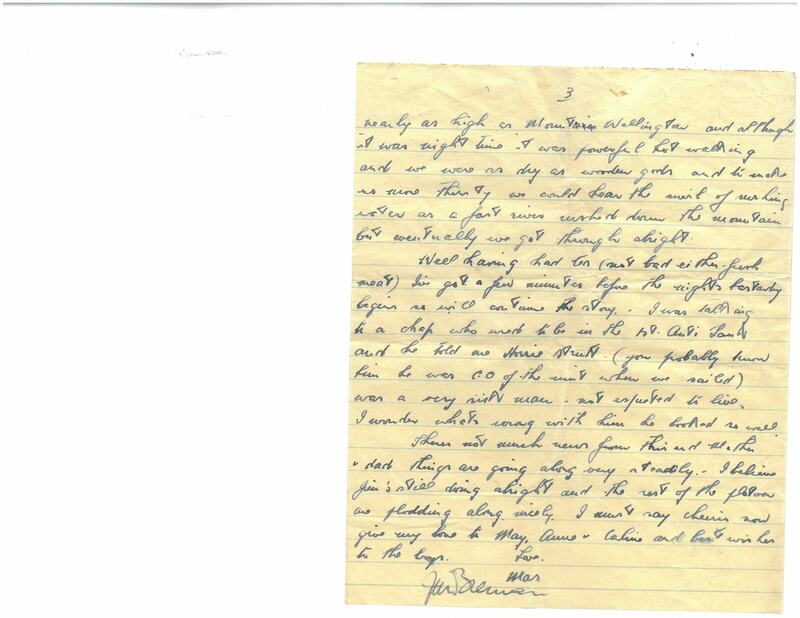 Reginald Hickman was a relative: his father John was the brother of Dad’s grandfather- ie John was Dad’s great uncle. I’m not sure what that makes Reg – I guess they would have called each other cousins. Reg enlisted in the airforce in 1941 and rose to the rank of Flight Lieutenant. 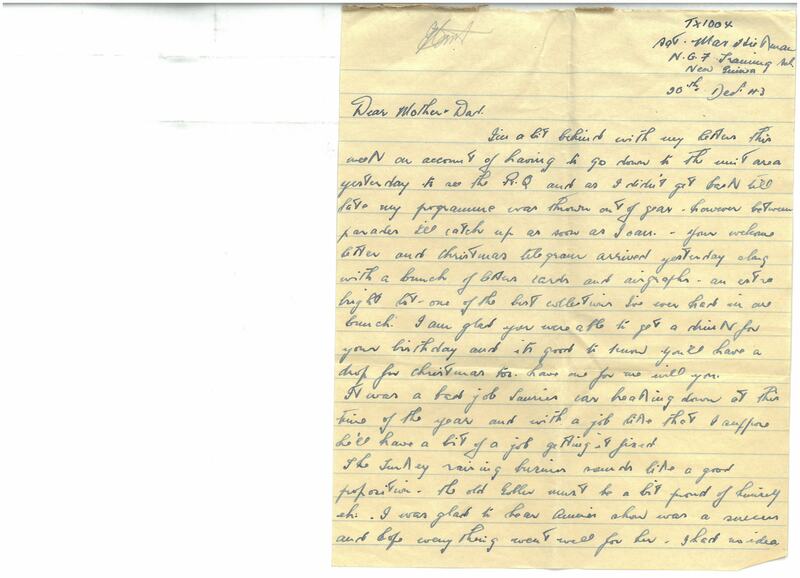 At dischargee in 1945 he was posted to the Aircraft Repair Depot. The mail service has caught up in a big way this week – your letters of the 31st and 8th both arrived during the last two days along with two from Ivy and several others so I look like having a very busy day today. 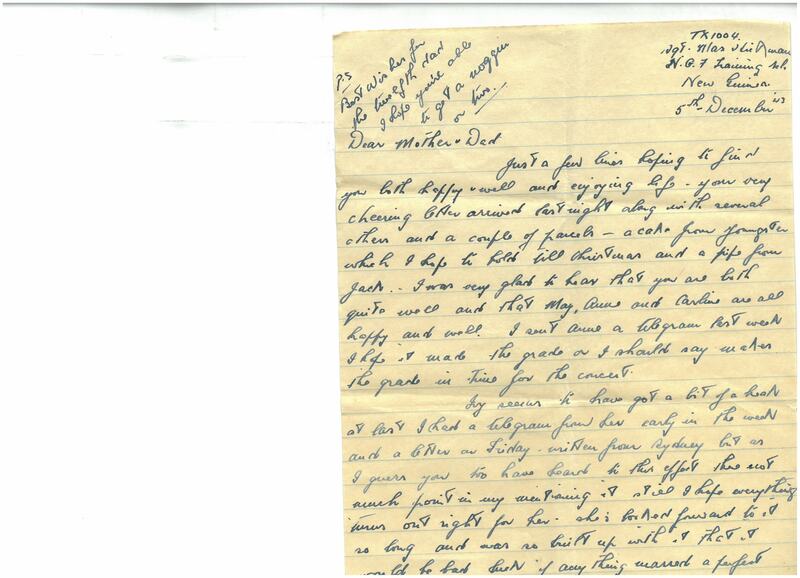 I was glad to hear things are going smoothly at home in spite of increasing civilian worries – your idea about turkeys should prove a real asset with meat rationing cut so fine – a few ducks would be handy if it’s not too late to set them. I guess the rabbits about will cop some punishment now: like the depression period this seems another time when the man on the land has a lot to be thankful for. It looks as though Australia has a big feeding job on hand and the government might do worse than withdraw farmers from the services – we’ve got quite a lot of them here – chaps between thirty five and forty – a bit old for modern campaigning, but at their best for rural production. As a matter of fact there’s a lot of talk about discharging men over thirty five from front line units. It may be just talk but it sounds feasible. I guess Tiny will get out on that count. Maggie was right about him rejoining the unit – a chap from his mob told me the other day that he was on draft to go up. I’m glad that school opening function was so successful. May had put so much work into it and Anne was so built up about it that it would have been bad luck if it had been a failure. It was a pity that wash away should have undone the good the rain was doing to your garden. Vegetables are sure to be scarce while the war’s on. We’ve been living extra well this last week. There’s been a cooking school on here and the stuff has been turned out as I suppose it was intended to be. Even dehydrated mutton and gold fish tasted good the way it was put out and anyone who can cook them and make them edible is definitely a cook on army standards. In addition we’ve had two vegetables at one meal sometimes, and two or three times they even put on scones so gastronomically we’ve done pretty well. I suppose new record high attendance records were put up at Flemington yesterday – everyone who could possibly make it would be there and I suppose all the yanks within a thousand miles would come along with their jeeps. They got a wireless from somewhere and set it up in one of the lecture huts and training was stopped for ten minutes but they couldn’t tune in so we didn’t know the result till tea time. Several sweeps were run. I had Saul in one and Illyrian in another but I gather that they also ran. There was a skipper here the other night to give us a talk on post war reconstruction and what the government propose to do for the troops. There’s been several sergeants from the AES have talked on it but it seemed so much eye wash, but this bloke seemed to have things at his fingertips and there might be something in it. I’m going up to the camp where he’s staying this afternoon to have a bit of a yarn to him about it. I haven’t had any word from up top lately so don’t know how the mob are going. We don’t get much of the Griffin here unless someone happens to get down to the base area on Sunday. I hope to go down next weekend as we’re due for a day off then. If I get time I’ll write to Viv or Jim this afternoon. Well I must say cheerio now Mother & Dad. Give my love to May, Anne & Carline and best sighs to the boys. 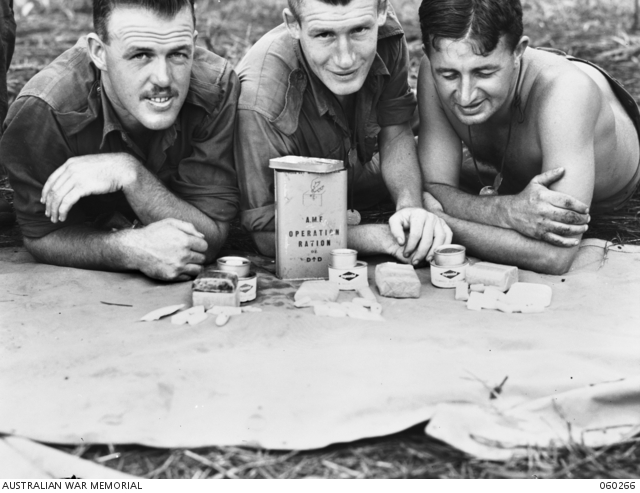 Meat rationing was however introduced, Australia-wide in January 1944. By late 1943 newspapers around the country were reporting on public meetings held to enable people to hear about and comment on the Government’s plans. The following year, a referendum would be held on increasing Commonwealth powers for the 5 years after the war ended..Dad will surely have views on this! Presumably the ‘goldfish’ were in fact whitebait which I was surprised to learn had been among the varieties canned in Tasmania for the AMF. On Monday 8th November the Hobart Mercury published this photo with a report on the official opening of the Lenah Valley School which had taken place the previous Saturday. (https://trove.nla.gov.au/newspaper/article/26000544/1866101) The school building was described as a modern brick building, containing two spacious classrooms. 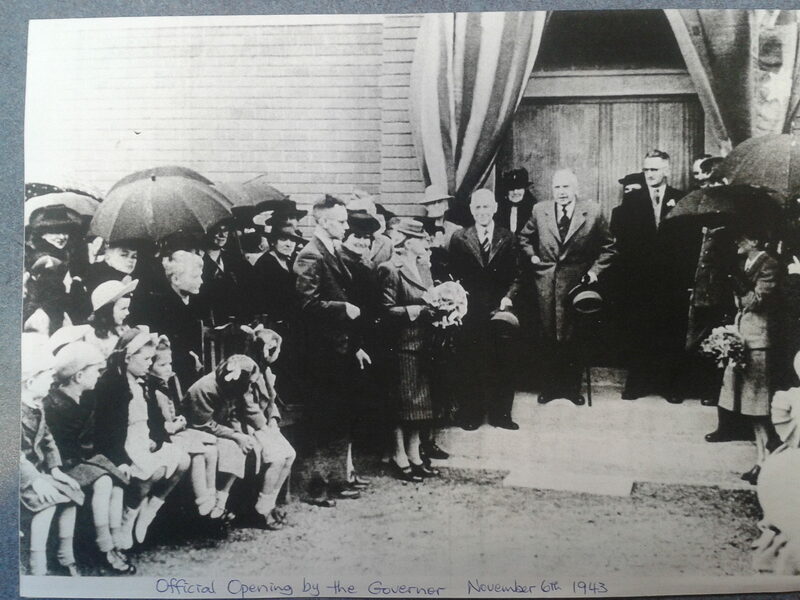 VIP’s present included the Governor and Lady Clark, the Chief Secretary (Mr Brooker) representing the Minister for Education (Mr Cosgrove) and the Director of Education (Mr G V Brooks) who paid tribute to the work of the head teacher (Miss S Craike). 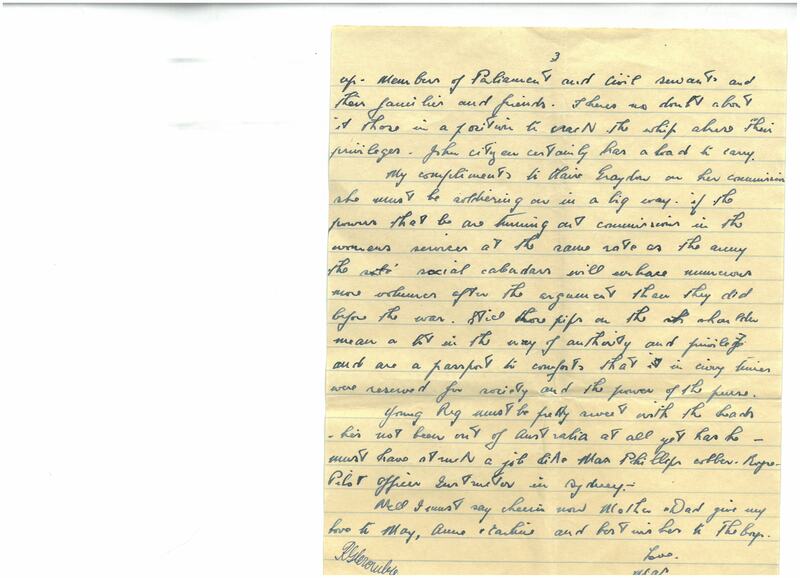 On Tuesday 9th a small supplementary item was published, including the statement that ‘The secretarial arrangements of the function were handled by Mrs L Fisher. (https://trove.nla.gov.au/newspaper/page/1866113) Mrs Fisher was Dad’s sister May (wife of Laurie), and her daughter – my cousin Anne – was one of the founding group of students who had begun their schooling at Haig Street hall. Dad was right about the record crowd. 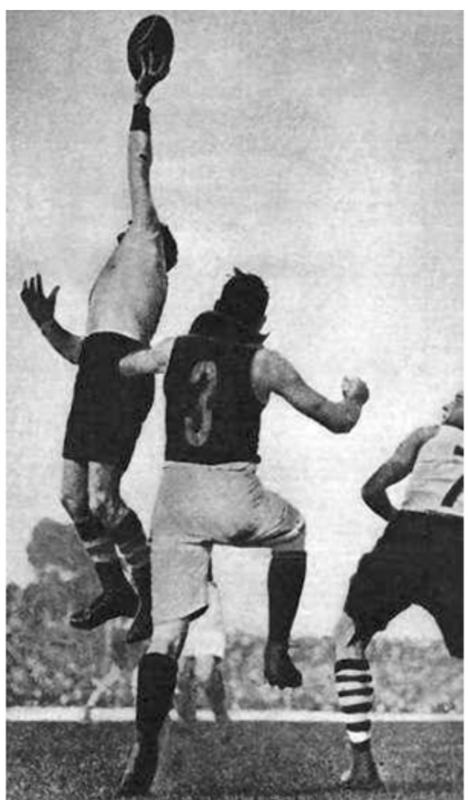 According to the Melbourne Argus (https://trove.nla.gov.au/newspaper/article/11797793) more than 90,000 people attended – the largest of any of the 5 cups run during the war. ‘Army khaki and Navy and Air Force blues dominated the colour scheme, but those who accepted those colours for tips in the Cup were disappointed.…Turnover on the tote was an Australian record £177,733. There is a British Pathe film of the race… http://www.britishpathe.com/video/1943-melbourne-cup . The crowd is indeed enormous! The War Memorial also holds a newsreel of the event, produced specifically to share with troops overseas. 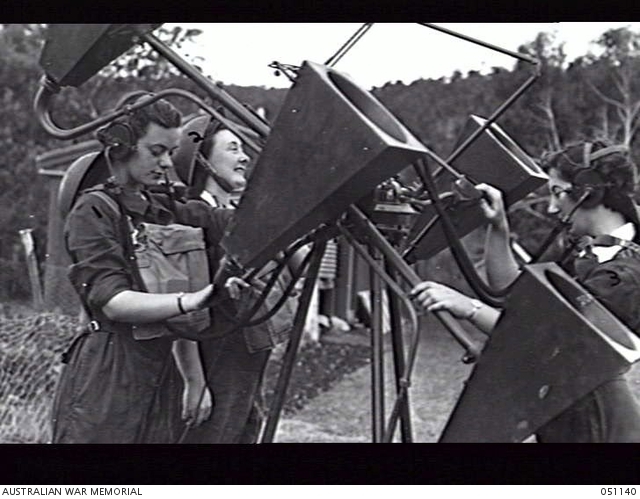 https://www.awm.gov.au/collection/F00793/ as well as a silent film showing troops listening to the radio broadcast. https://www.awm.gov.au/index.php/collection/C190178 Although it’s not possible to view these online, the caption for the latter is interesting: Time off was taken to hear the broadcast of the Melbourne Cup. Although no money passed through any hands, it was quite common to see 4 pawpaws to 1, or 6 ounces of tobacco to 1. Everyone showed a keen interest just the same although the race was barely audible owing to static. The bookmaker had a worried look on his face after the race as he lost thirty ounces of tobacco and forty pawpaws. 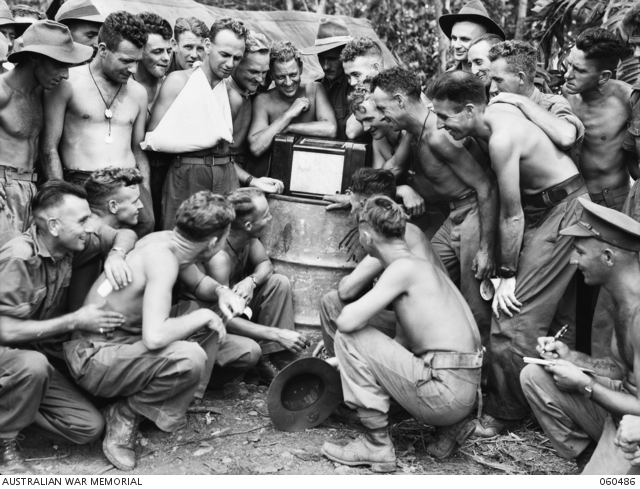 Troops of the 7th Australian Division, headquarters company, listening to the running of the Melbourne Cup. Just a few lines hoping to find you both happy and well and enjoying life. I’m afraid I’ve left my letter writing a bit late today as I hoped there would be a letter for me in tonight’s mail. There’s so little to write about here that without a letter to reply to, it leaves very little scope however I’ll give you a resume of local doings, such of them at least as the army permits and as would be of interest to you. I had two very cheerful letters from Youngster during the week together with a parcel from that fruit crystallising place in Melbourne. It was very nice too. Youngster’s letters were a real pleasure – both she and the baby seem to be going along nicely which is great news after the bad run they have both had. She’s very keyed up with the prospect of getting to Sydney in the near future and thinks it possible that Bill may get down for a few days. He certainly must be in sweet with the Navy, but I hope he’ll be able to make it as I’d like the trip to be a success. Bill’s brother must be in right too, to be stationed in Sydney so long. Another of the old hands came back to the school yesterday and gave us the Griffin on affairs in the forward area. The unit seem to be sitting pretty at present and living quite well, all things considered. It seems there are wild cattle there and fresh meat is reasonably plentiful – three or four times a week anyway. Jim & Viv are going along nicely but Kong Young has been evacuated to hospital. Ray has been a platoon commander for some time so I expect to hear of him going back to an officers school anytime. He’s well within the age limit and as an original member of the unit must be well in the running. He’s an extra good fellow and will make a good officer. Do you happen to know Captain Bethune Dad? He lives in Hobart. I don’t know whether he belongs to the Club or not but he has become quite famous as the result of orders issued to a gun crew during the last argument. 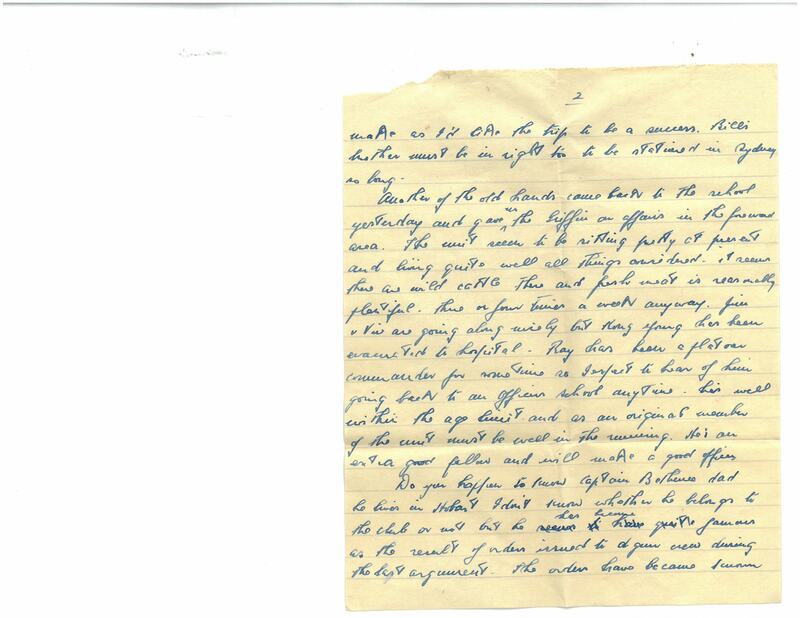 The orders have become known as the Spirit of the Gun – they were first promulgated to us during a stand to in England and later we became familiar with them whilst attached to a machine gun battalion and now during this last week were made the subject of an address by the CO of the school. 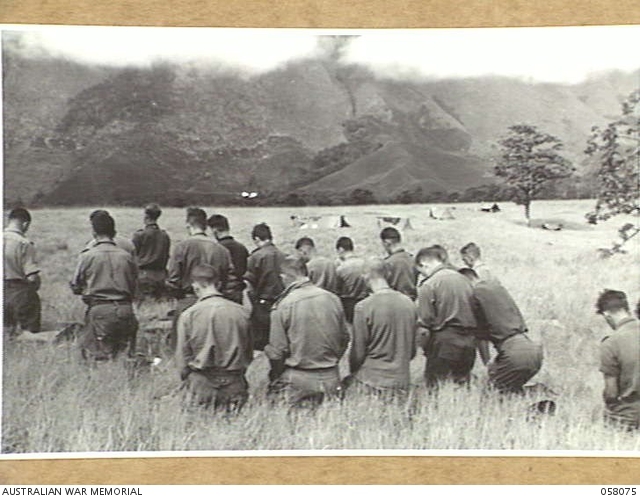 So they seem to have been accepted by the entire AIF as the drill. Bethune has acquired more fame from those orders than almost any VC winner. Life at the school is very much the same although we’re getting more variety in the work. There’s still a funny side to everything and from the onlookers’ point of view some rare sights. 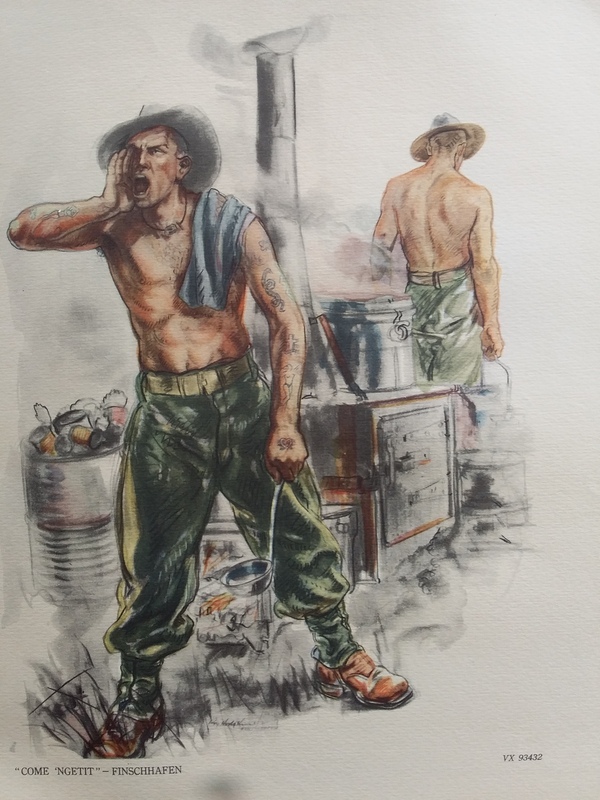 When the company commander takes company drill and after giving the Griffin nominates chaps from the platoons for command posts, the fun starts as he quite often gets a chap who’s been a cook and lost his tin opener or a clerk who’s lost his pencil and hasn’t had much infantry training. The orders conceived are really amazing and the formations resulting from trying to carry them to effect are very amusing and the disentangling drill an entertainment in itself. Tommy D’Alton has taken a bit of a step along hasn’t he – Commissioner to New Zealand – quite a jump up the social ladder – but I don’t suppose the job will call for much beyond a few speeches at dinners and political turnouts. Who’ll get the job at home Dad? Do you know who’s next on the list for Darwin? I don’t suppose it will involve a by-election. There’s not a state election due till 46, is there? And now Mother & Dad I guess I’ve about said my piece so will say cheerio. Give my love to May, Anne & Carline and regards to the boys. In The Footsoldiers (p431) , a list of expressions described as ‘Quips and Howlers’ includes The Griffin: What’s cooking’, the good oil, what do you know? and the great ‘They say’. 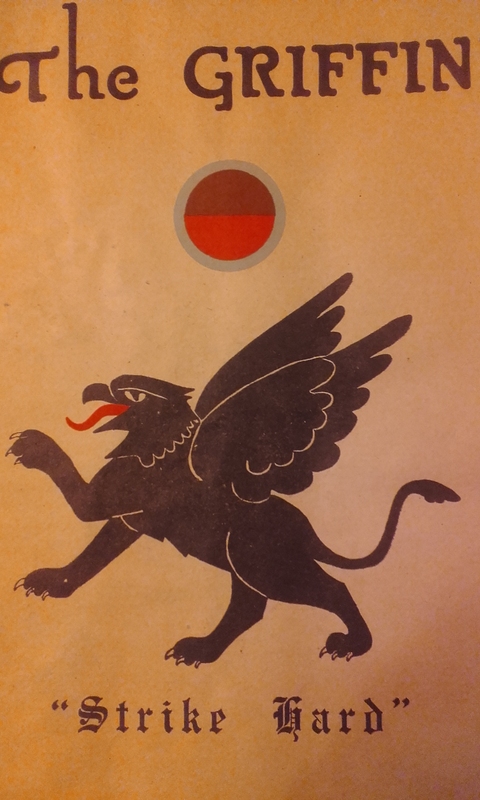 The Griffin was also the name chosen for the unit newsletter which was published ‘nearly every week when out of action’ by the Intelligence Section. The first edition was dated 31 March 1943. Generally, these were very modest affairs, but occasionally a ‘special edition’ was produced more professionally, with a strong cover emblazoned with the crest adopted as the unit emblem – and the motto ‘Strike Hard’. 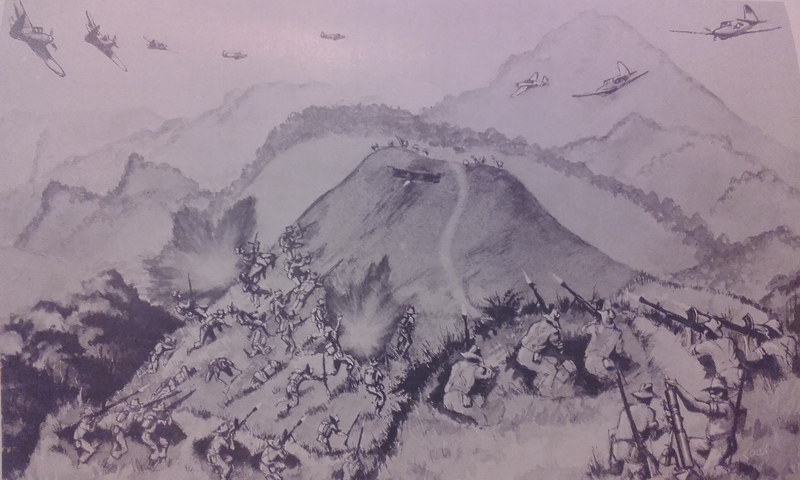 After being relieved by the 2/31st, the unit established a base close to the Mene River. 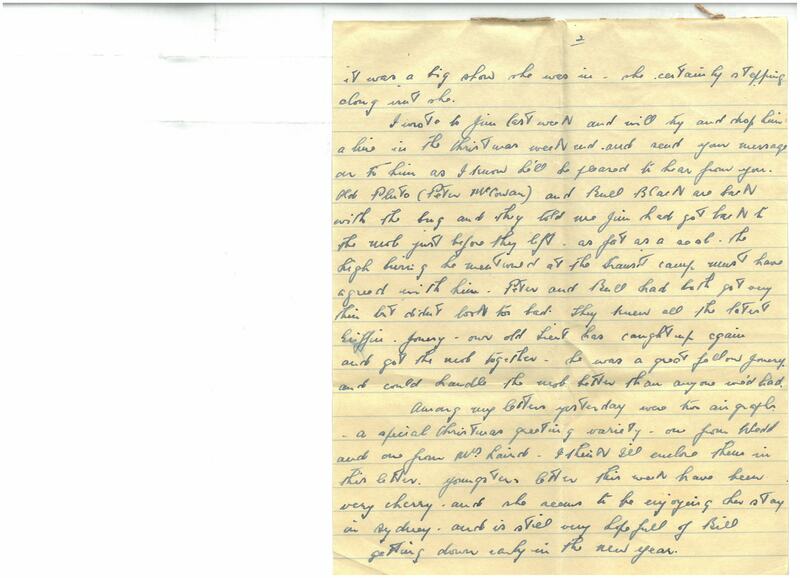 This position “was to remain our permanent base in the valley until we were relieved on 1 January 1944…. Huts could be built, beds erected, etc, just like any training site. 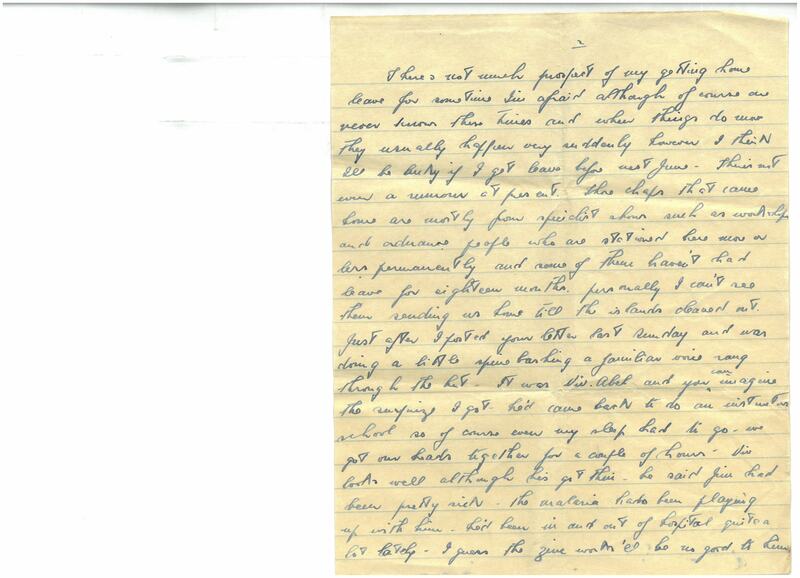 Fighting and reconnaissance patrols would continue every day, but stand-tis would be dispensed with until further notice… The Battalion – like all other units of the 7th Division in the valley – fared very well. 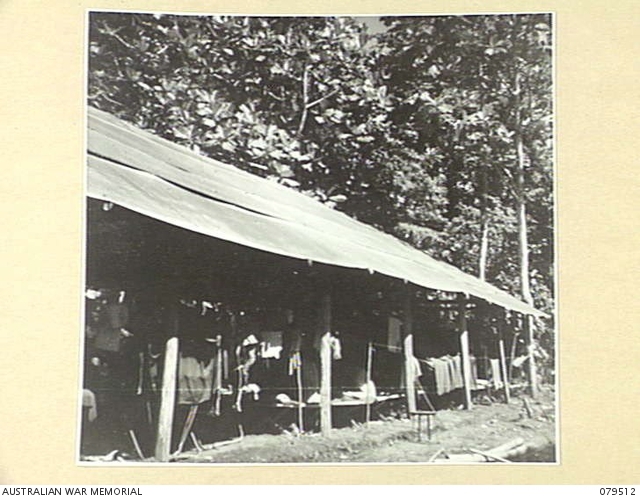 Apart from one or two days during moves or patrols, ….two hot meals every day. 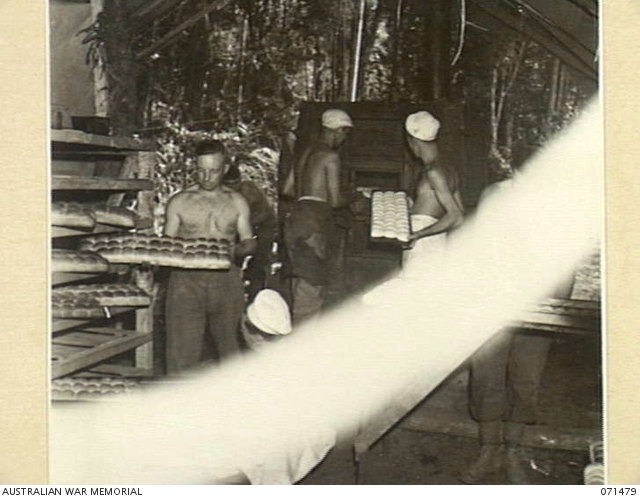 Twice a week fresh packed beef was brought up, and the cooks baked bread almost every other day. Fresh vegetables and fruit were served at least three times a week. 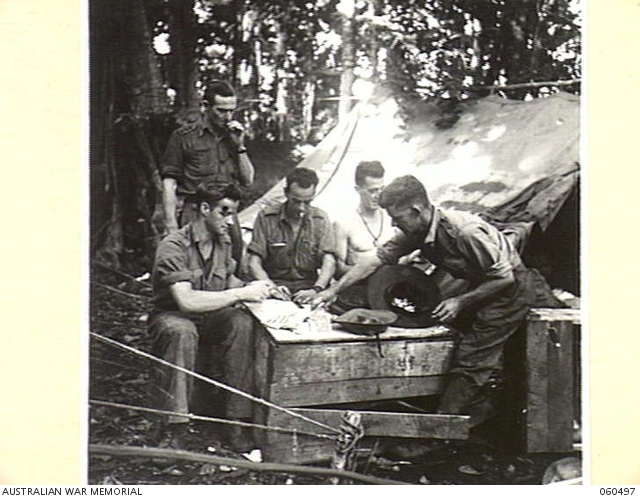 By the end of October mobile cinemas were operating once a week in unit lines, the Pioneer Platoon providing logged seats for the troops’ greater comfort…..” (The Footsoldiers pp351 – 353). 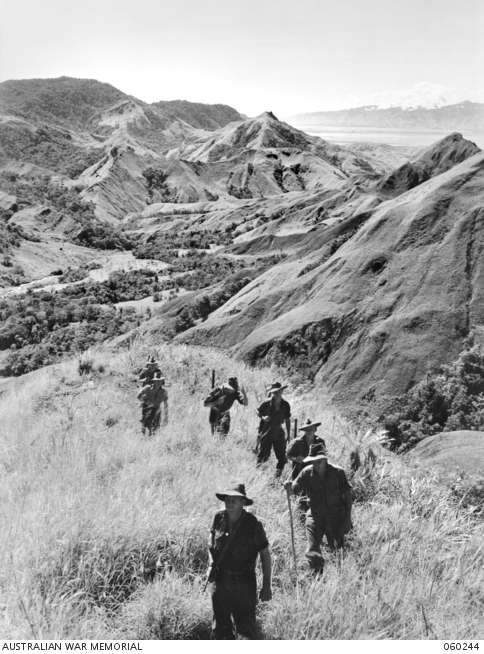 Units of the 21st Australian Infantry Brigade marching along a winding track in the foothills of the Finisterre Ranges one their way to the Ramu Valley after being relieved at the forward position by troops of the 25th Australian Infantry Brigade. Those mentioned are Jim McDonnell (TX1024) and Viv Abel (TX797). 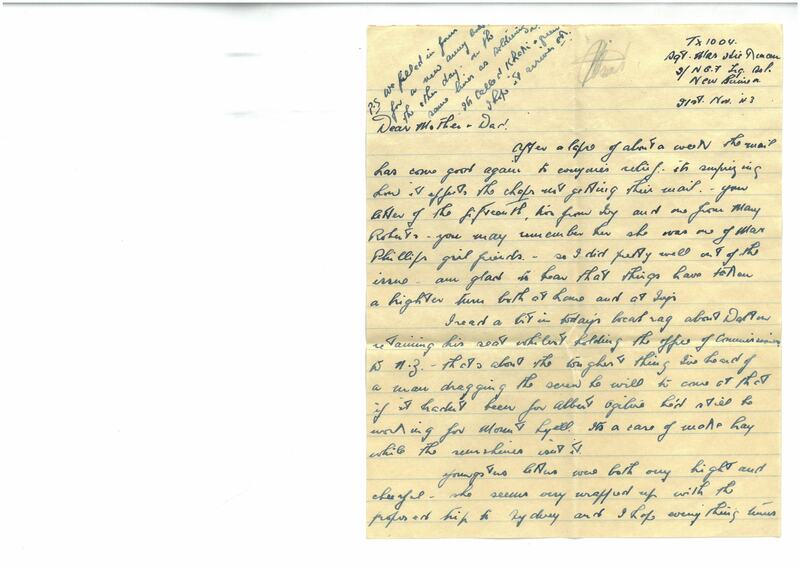 Jim and Dad enlisted together at Brighton on March 4 1940. 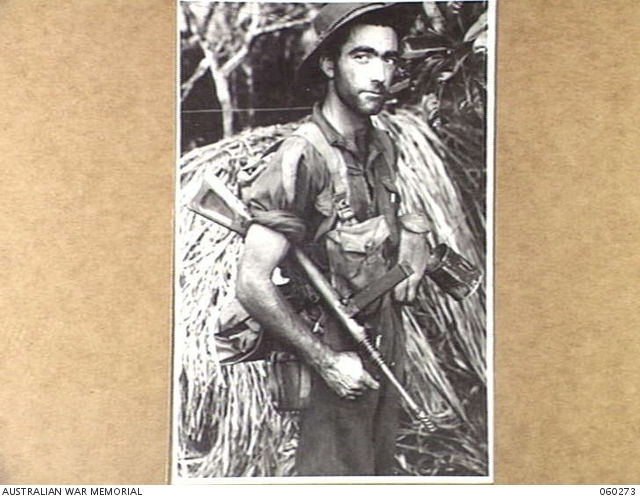 Viv who came from Deloraine in the north, enlisted three months earlier. 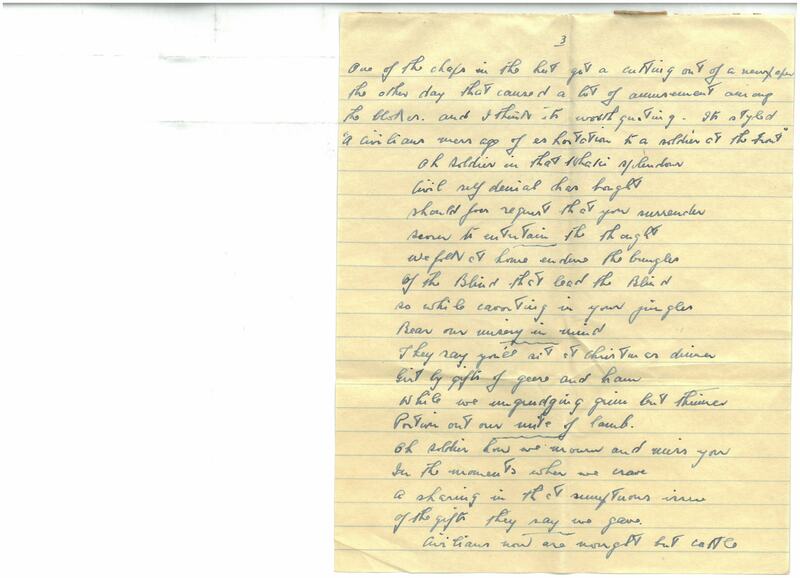 All were ‘originals’ of the 2/33rd. 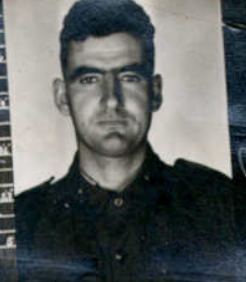 Kong Young (real name Kenneth) had also enlisted the previous year – in December 1939 – in Subiaco, WA, and had been a member of the Carrier platoon with the others in England and Syria. 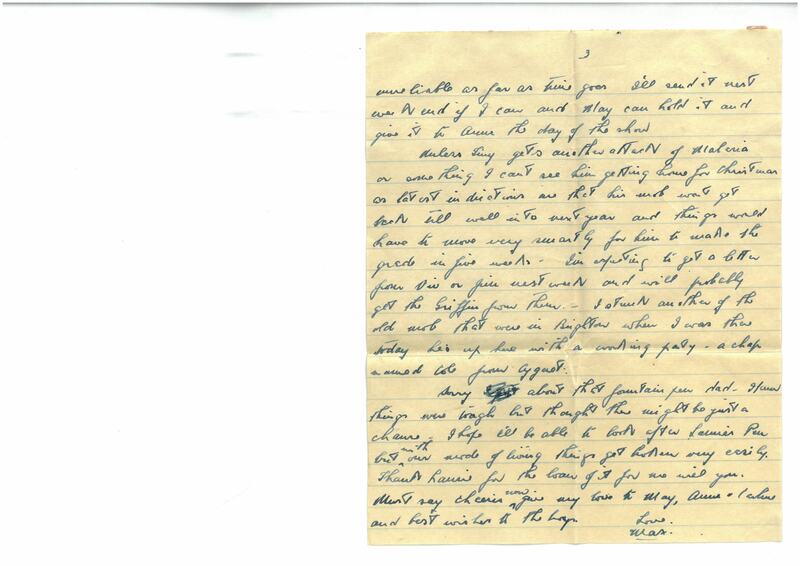 Ray Ross (QX1146) had also been a member of the platoon, and Dad often mentions him both as a friend/ ‘partner in crime’ and as a potential officer. He rose to the rank of WO2. 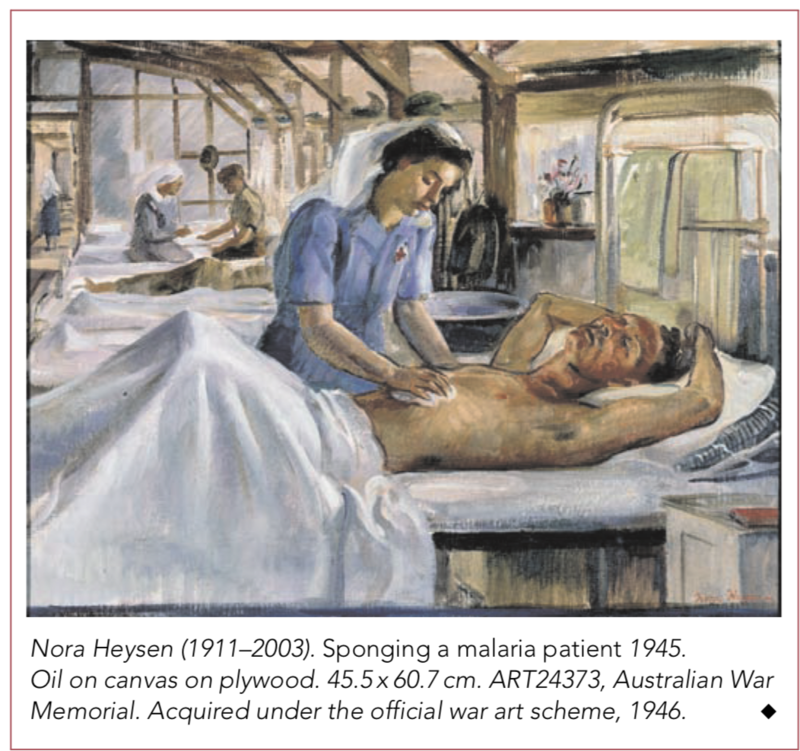 Bill Crooks reports in The Footsoldiers (p353) that there were still worrying numbers of men contracting malaria, which was ‘rampant’ – by mid-December evacuations numbered 9 officers and 178 OR’s – with scrub typhus a further cause of sickness and even death. 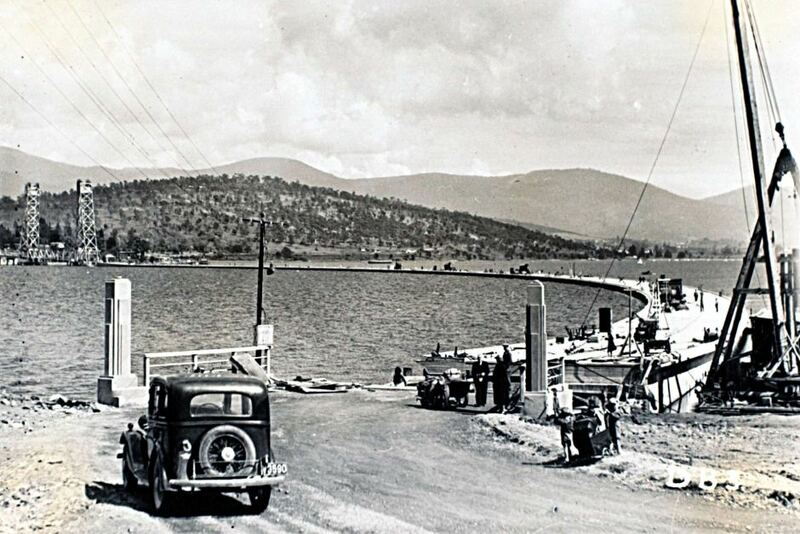 In fact, Frank Bethune had died in Hobart in December the previous year. 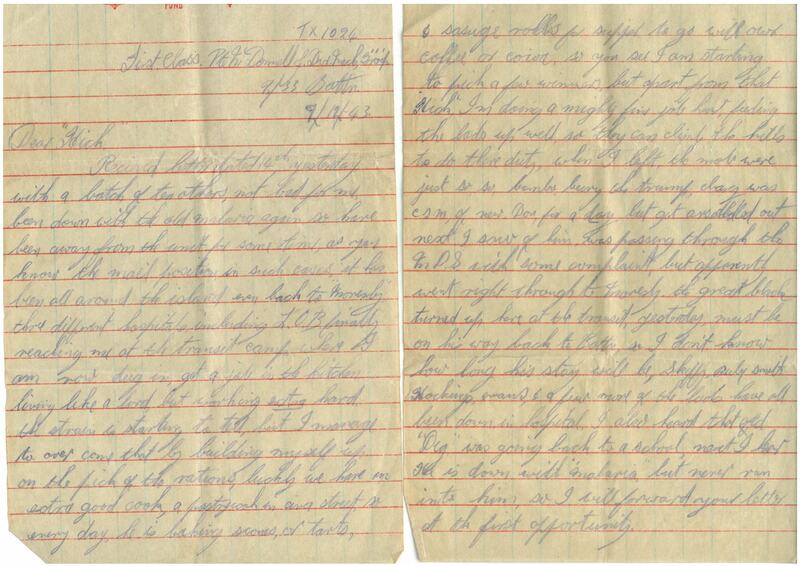 The orders that made him famous were issued at Passchendale in March 1918. Bethune’s group (no. 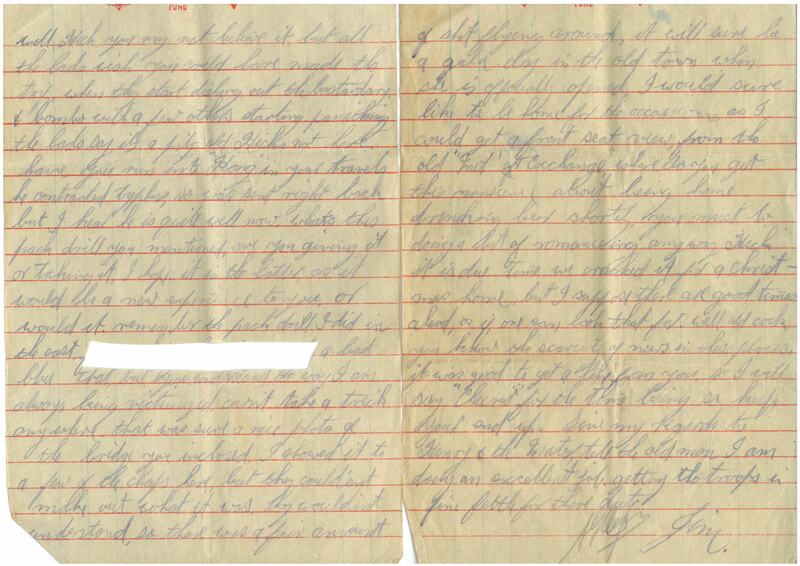 1 section, 3rd Machine Gun Company) survived in their position until relieved. The orders passed into military history, were circulated throughout the allied armies in France and embodied in British Army Orders until 1940. After the fall of Dunkirk, they were reproduced as posters under the caption ‘The spirit which won the last war’ and displayed throughout England. (http://adb.anu.edu.au/biography/bethune-frank-pogson-5226) I can find no reference to them as ‘the spirit of the gun’ but of course this terminology may have been used in training courses. 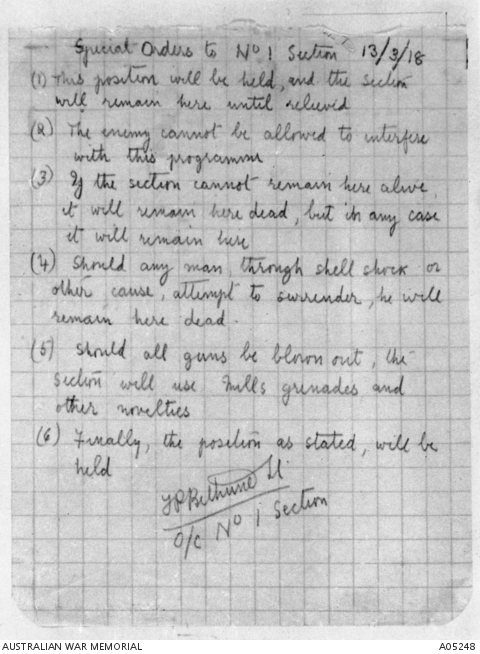 Frank Bethune’s order : Basically, this position will be held at all costs: there will be no surrender. Even though Bethune may not have expected his orders to have been obeyed to the letter, he had enough knowledge of and confidence in his men to be able to write such an order. 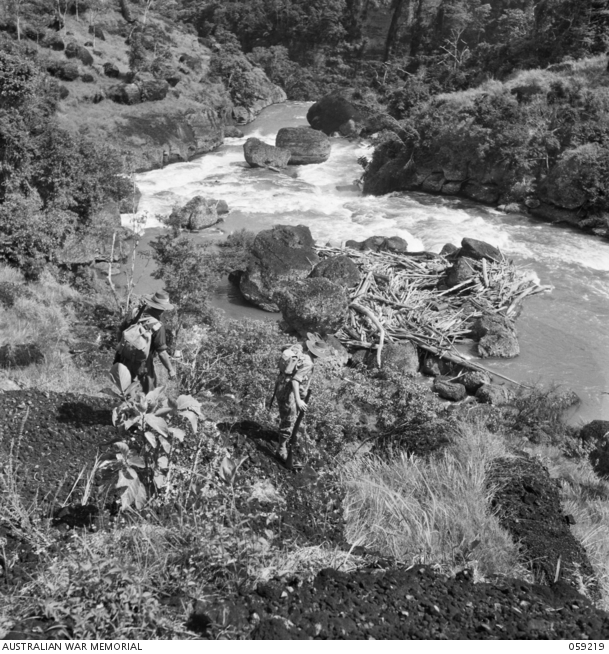 A patrol of the NGF Training School (Jungle Wing) at the edge of the Laloki River near the Rouna Falls. Must try and race a few lines off. I’m all behind with my letter writing this week on account of going out on Sunday. We’re that busy during the week and hut restrictions are so solid that it’s a matter of stolen moments only. Your welcome letter of the 17th arrived yesterday. I’m glad to know things are going alright at home and that you’re both quite well and happy. Rob Cameron has evidently been around a bit. It’s a good thing for him really. There’s no doubt you see a bit when you’re in the show and if he’s not tied down to army routine would have much more scope than we do. I suppose he must be in something the same category as reporters. I’ve had quite a bunch of mail this week but won’t be able to answer it till next weekend. There were three from Ivy – all very light and cheerful – she seems much happier about the baby these days as she’s come to realise that the excema is not affecting him in any other way and now that she’s finished the income tax returns for …. she is happy to give all her time to the little bloke. 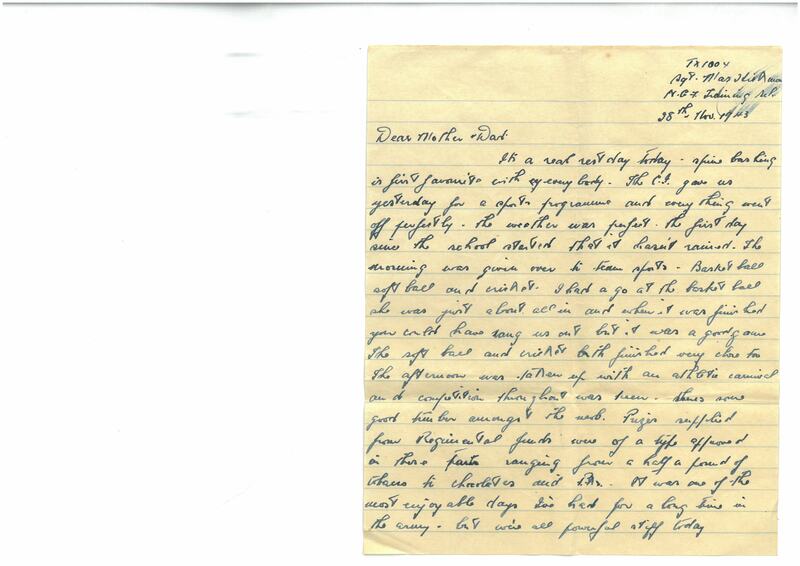 Daph Wise wrote a nice cheerful letter too. She said she was coming out some time to play cards. 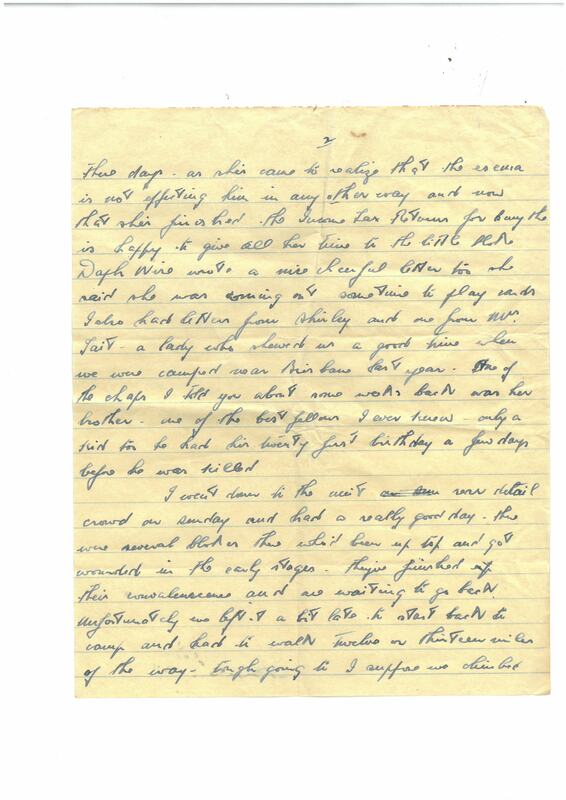 I also had letters from Shirley and one from Mrs Tait – a lady who showed us a good time when we were camped near Brisbane last year. One of the chaps I told you about some weeks back was her brother – one of the best fellows I ever knew – only a kid too – he had his twenty first birthday a few days before he was killed. I went down to the unit rear detail crowd on Sunday and had a really good day. There were several blokes there who’d been up top and got wounded in the early stages. They’ve finished their convalescence and are waiting to go back. Unfortunately we left a bit late to start back to camp and had to walk twelve or thirteen miles of the way – tough going too. I suppose we climbed nearly as high as Mount Wellington and although it was night time it was powerful hot walking and we were as dry as wooden gods and to make us more thirsty we could hear the swirl of rushing water as a fast river rushed down the mountain but eventually we got through alright. Well having had tea (not bad either – fresh meat) I’ve got a few minutes before the night’s bastardry begins, so will continue the story. 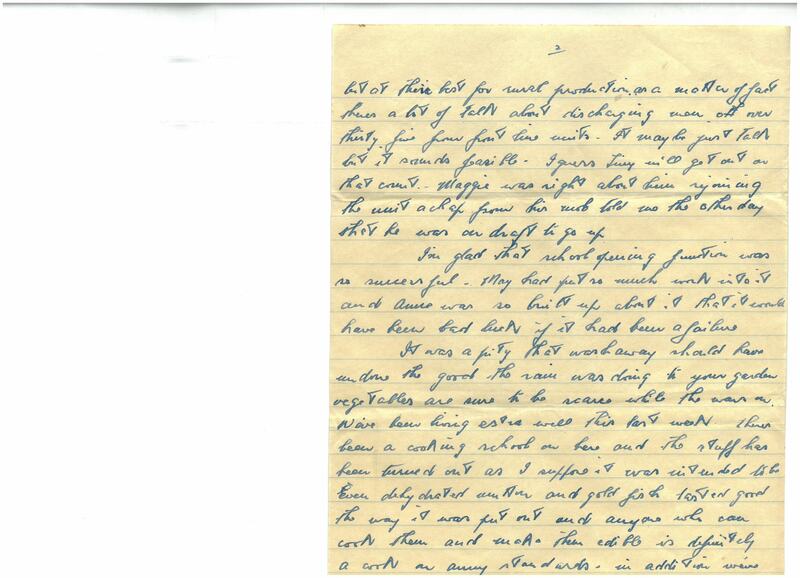 I was talking to a chap who used to be in the 1st Anti-Tank and he told me Horrie Strutt (you probably know him – he was CO of the unit when we sailed) was a very sick man – not expected to live. I wonder what’s wrong with him – he looked so well. There’s not much news from this end Mother & Dad – things are going along very steadily. I believe Jim’s still doing alright and the rest of the platoon are plodding along nicely. I must say cheerio now. Give my love to May, Anne & Carline and best wishes to the boys. We’re that busy during the week…. There is no Tasmanian of this name on the world war II nominal roll. (http://www.ww2roll.gov.au) It seems he had an interesting role – ‘not tied down to army routine’, ‘something the same category as reporters’… so maybe PR? It will have to remain a mystery to me! 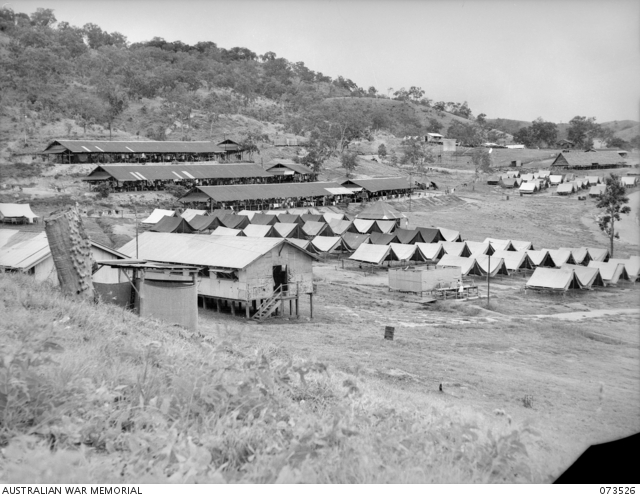 I’m not sure exactly where this camp was, but it’s possible the reference relates to the ‘details camp’ on the site of the old Murray Barracks in Port Moresby. 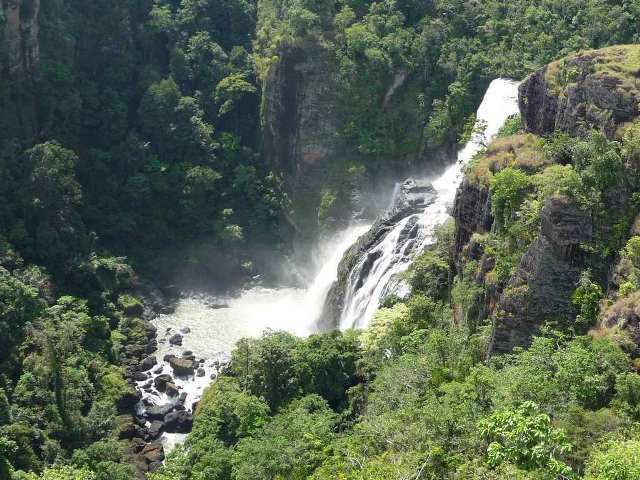 They would certainly have been able to hear the Rouna Falls on the Laloki River… now a major tourist attraction in the area.